Jenna and Mike explore a variety of restaurants, with a variety of couples, creating a variety of double date experiences. The result? 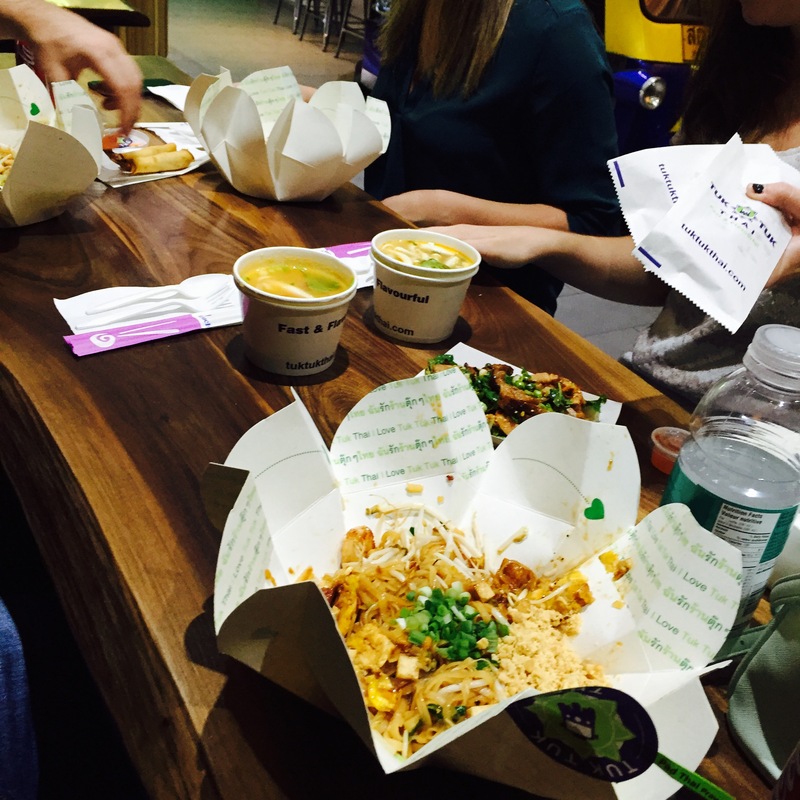 Helping you decide where to go for a flavour explosion on your next date night...good, bad, or ugly. Better late than never right!? 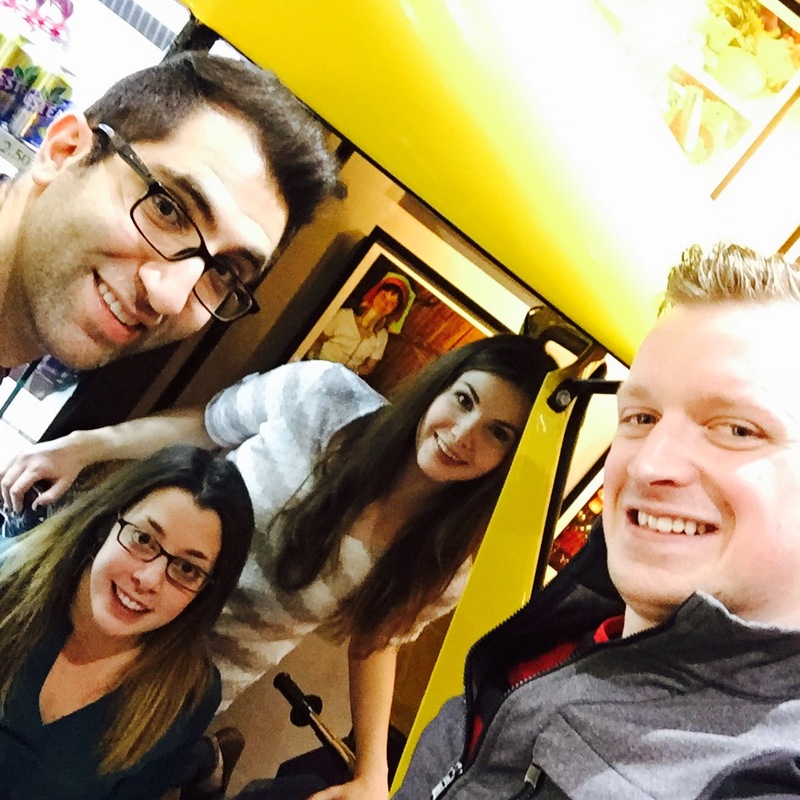 Below is a compilation of reviews done with one heck of a fun couple over a weekend in Banff. Mike has titles for the restaurants, the rest of us have ratings on each restaurant. Wowzers, for me this is probably the closest thing to a 5 outta 5 I have ever eaten. Right up there with Briggs in my opinion. The lamb was fall off the bone, the waitress was sassy in a polite way, the ambiance left one feeling like they are joining homer on his odyssey, and the value was… well… considering it is Banff it did alright. The flaming cheese, and lamb shanks were amazing. I also had the pita which would have given “Opa!” A run for its money! This was also, one of the only times in my life, I ordered an entre AFTER we finished the appetizers, it was an extremely relaxed, divine, evening and we will be returning again! Banff Adventures Sleigh Ride – Sleigh Okay! In the lane, snow is glistening – It most certainly was, but it did not seem to faze the horses as they plugged along, we even saw an elk herd! Walking in a winter wonderland – This should most certainly be on everyone’s list to do if you have not already… I have been to Banff many times and always missed out on this gem! Only once though…. As far as burgers go, this place is one of the best. Don’t let the small, cramped, space deceive you… this place is worth the wait. They can even take your number and text you when a spot opens up. 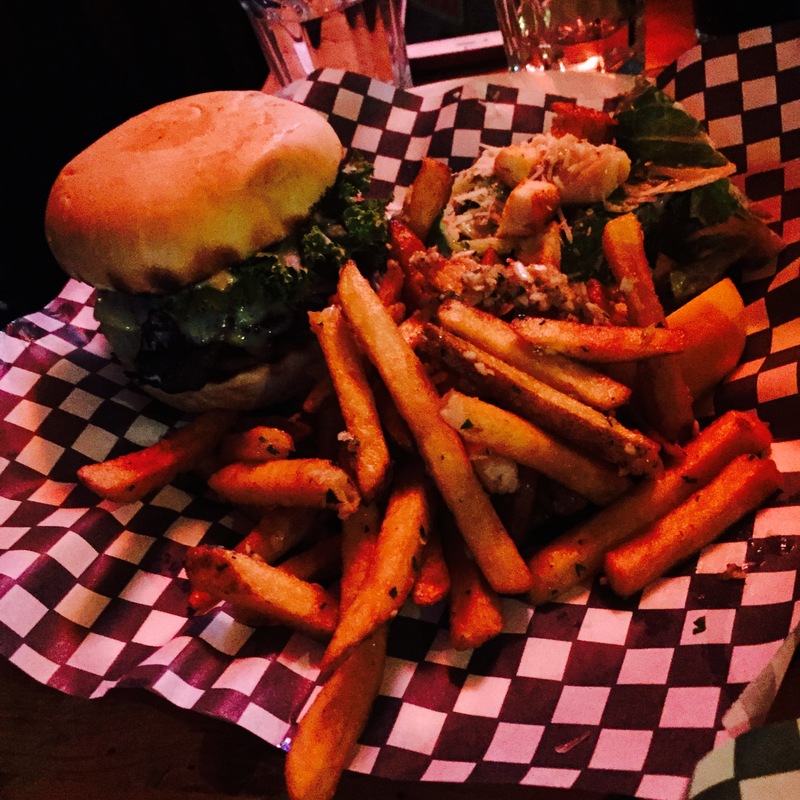 From poutine to burgers everything hit the spot. It was definitely not a fancy feast, but after hitting the slopes you would want to hit this place next! We first walked into “Korean Seoul Restaurant” while trying to find the shortest distance from getting to the main street… to the back parkade. It had a lot of space… but we were the only ones in there, not unlike the offices in downtown Calgary now-a-days. I immediately made the mental note to return as I love two things… new food…. and short routes through parkades. The food was great (I had the beef tongue) but the real great experience was you cooked it all yourself at the table! It was so much fun to go at our own pace, and to our own liking. I found the beef tongue extremely tender and amazing but Jenna said she didn’t want to try the tongue… but if you ask me she was…. “Tongue in cheek” about it. If you do go, I suggest you try the more exotic stuff but they do have some delicious standards like chicken and beef. Anyone who reads our blog… so my mother only and even then she skims it… knows that I am not a desert man. I must admit however that in Banff I was on a mission for something sweet, and the Maple Leaf hit the spot. We went only for desert and it sounded like there was a part going on in the upstairs (if you are looking for nightlife maybe check it out). The real highlight though was my staging of the below picture…. Which was the best part of the entire trip in my opinion…. Our last day before we left we hit up Tooloulou’s for some breakfast that may even give OEB a run for its money (I know, Calgary blasphemy). Despite the painfully slow service (I think this was just our waitress… the rest looked amazingly fast) this place was still one of my highlights. Smoked salmon, hash browns, coffee, pancakes, ham, bacon, this place had it all and everything was on point! 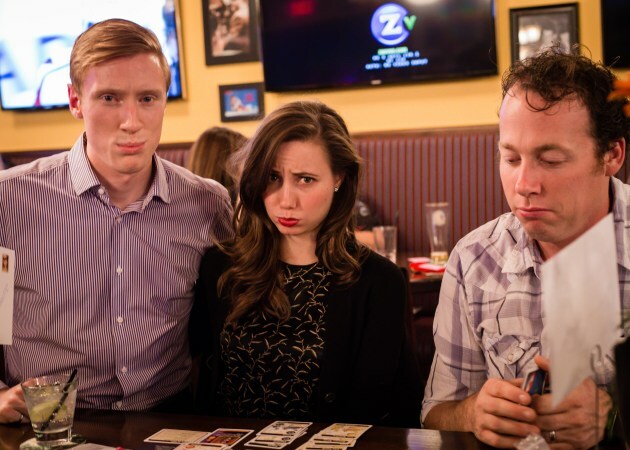 It wouldn’t be a review without a little plug for our Board Game Evening’s we run in YYC… what? You would like to go to one you say? Well check the Facebook group “Games YYC” here. The game exploding kittens reminded me a bit of “Cards against Humanity” in terms of content however plays much more like a game of chance. 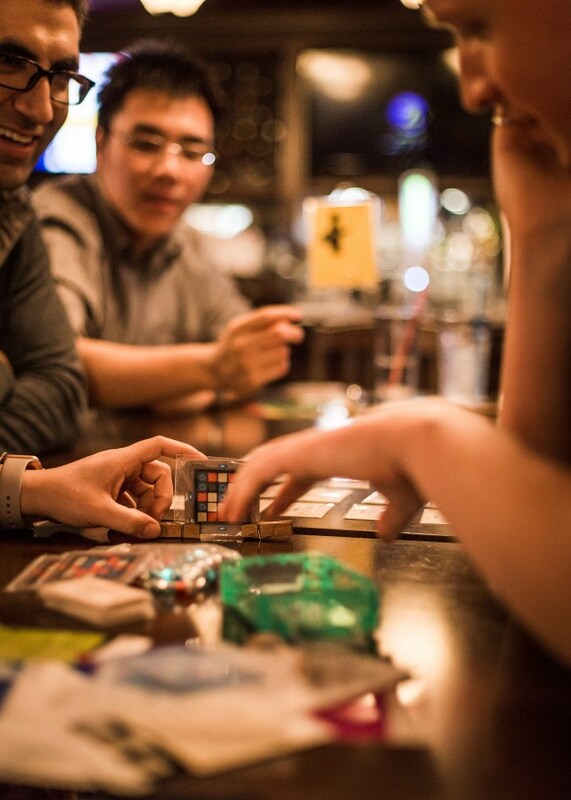 It does not take a mathematician to realize the optimal way to play the game is to collect cards and take more chance early on, however I could still see it being a fun drinking game. I do not think it will become a staple at our events as it gets boring quick, but you may see it around if we have a lot of requests. I love Greek food, and I don’t think I realized how much until we went to the Balkan for our first meal of the weekend. The atmosphere was elegant and warm with beautiful Greek decorative touches around the restaurant including a stone sculpture at the front. I admit that apart from OPA! and the Broken Plate, I have not frequented many other Greek restaurants. This was mostly because I thought those places had some pretty good Greek. However, I think it is safe to say that the Balkan was the best Greek restaurant that I have been to yet! Where do I even begin? First of all, I ordered a dirty martini because from time to time I like to feel like James bond. The martini was mixed to perfection and they gave me 4 olives! I am not talking those small dinky olives, I am talking the prime succulent green olives. We decided to order four appetizers to share so we could really get a flavor for the food. In order of my favorites we had the lamb ribs, the Greek meatballs with yogurt, the kalamari, and the saganaki with pita. All were exceptional but I didn’t love the saganaki, it had a slight licorice taste to it and just wasn’t quite cheesy enough for me. For my main I figured that I shouldn’t stop a good thing so I ordered the Lamb Shank to continue my enjoyment from the lamb ribs. I was not disappointed. The lamb was so tender and oh so fall off the bone juicy I never wanted to stop eating it. The side of vegetables were good and the rice was just okay. I didn’t finish it and would have rather had extra vegetables as it was more just a bland filler. Our server was lovely and definitely made for a good experience. I mean c’mon, she put 4 olives in my martini. If you are in Banff for an anniversary I think this would be a great choice! Do you like horses? Do you like beautiful mountain scenery? Do you like magical moments of giddy bliss? Do you like snow blowing in your face? Then the Banff Sleigh Ride is right for you! In all seriousness though this was a great way to spend a morning in Banff. It was nice to get out in the fresh (albeit) cold air and learn about the mountains while gliding through the snow. You start at a beautiful wooden bard where they give you hot chocolate if you want it! Then they take you out with some blankets to start the ride. The view was beautiful and the tour guide was great about telling us stories of the mountains, their names, and how they came to be that way. We also saw some elk which was really neat, it was like a winter safari. It goes by quickly but what doesn’t when you are having fun? An hour is long enough as it was pretty cold and there was some snow blowing towards us, but it was great at the end to be able to stand by the campfire and roast marshmallows and drink more hot chocolate. They also let you say hello to the horses which was a favourite for me. They are just so darn majestic! If you have never done one before I would highly suggest you try it out the next time you are in Banff! I have eaten a lot of burgers in my day, almost too many, almost so many that I never want to eat another burger, but Eddie’s Burger made me re-think my whole view on burgers. I had been here once before a long time ago and remember it being quite good. I just didn’t remember how good. First you have your bun which is like some kind of god-sent butter bun that is as soft as a pillow. It melts in your mouth. If this is not enough it has a great beef patty with some siracha (red), mayo (white), blue cheese (blue), as well as some tomato, some lettuce, some bacon and love. That’s right love. On top of all this they also included a hot siracha wing on the top of the burger. I am salivating again. I couldn’t believe my tastebuds. The poutine also had a more beef gravy on it which I appreciate and a nice amount of authentic cheese curds, not just some grated mozzarella like some places do. To sum this all up, I think it would suffice to say that I would be content if the only burgers I ate in Banff were from Eddie’s. They did it. Check them out. When our fun fancy crew first stepped through this restaurant to get to our vehicle I knew that we had to try it. As soon as you walk in there are tables with their own hotpot in the middle as far as the eye can see. I have not tried a ton of Korean food in my life so I was excited to dine here and see what delicious things were in store. The ambiance wasn’t too out of this world but it was enough to get me intrigued. I quite enjoyed my experience here because it was something new! I am also quite a big fan of Asian cuisine so I enjoyed it quite a bit. I don’t know if I would recommend it to everyone but if you like Kimchi and you like cooking up a storm, give it a try! To start off, I should mention that we only came to The Maple Leaf for dessert, so please note that this rating does not reflect the restaurant as a whole. After a big ol’ Korean meal I was looking for something sweet and tasty to finish the night. There were multiple desserts but the one that stood out to me was the raspberry peach crumble with vanilla ice cream, I mean how good does that sound? 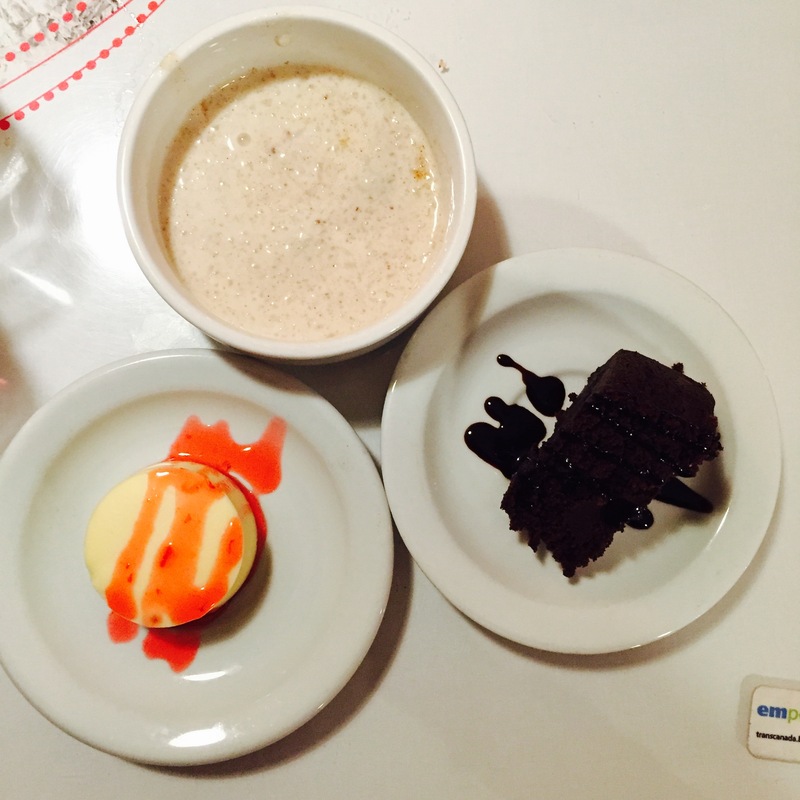 I will tell you, so good that I chose to forego the cheesecake and the Crème Brule which are some personal favorites. I got myself all jazzed up for this delicious mountain of dessert joy but all that jazz was deflated like a soufflé when it actually got to the table. The desert wasn’t like the crumble I was expecting. I thought there was going to be whole peaches and muddled raspberries in an almost pie/crumble like form with the ice cream melting beside it. What I got was sickly sweet raspberry jam it felt like with barley any peach flavor and crunchy hard crumble on top that was flavorless. Needless to say I was a bit disappointed. If I ever went back I would definitely try a different desert, or maybe just go for the food. Now here is the thing about Tooloulou’s. I know it could have done better if I had ordered something a little less adventurous, and if the service had been better. The service, if I am being honest, was pretty atrocious. I haven’t dealt with that bad of service in a while. What made it so bad was a mix of the fact that there were multiple empty tables that could have seated people and then been cleaned, but 2 of the workers instead of stepping in to help clean these tables just looked at them from the back of the room and let the one waitress struggle with the rest. Also, even when the tables were clean, they wouldn’t let us sit until the table was set. And then when we asked not to be seated by the door, they still tried to seat us by the door and ignored our request for a table in the back. If this was not enough, our waitress was super slow and when we ordered our food she felt the need to tell us that the plates were really big and that we were order a lot of food, over and over again. Aside from all that, the atmosphere was fun an eclectic. The place had so many neat decorations as well as a crazy tray of hot sauces from all over the world for you to try at your leisure! The food was really good generally speaking but I ordered the crab and asparagus omelet. I should have known that it was not going to be authentic crab, but canned crab with no added spice or flavor so it ended up tasting fishy. I did have some bites of the others food though and it was quite good. If I went back it would have been breakfast poutine all the way. Regrets, regrets. Overall it was a great weekend with some scrumptious meals, great company and new experience. Until next time Banff! Our first stop on this weekend of indulgence, was The Balkan. A modern yet rustic Greek restaurant, in the heart of Banff, featuring family recipes straight out of Yiayia Joanna Karlos’ kitchen. By the time we drove to Banff, we were famished! Resulting in us ordering four appetizers to share: kalamari, Greek meatballs with yogurt, saganaki with pita, and paithakia (lamb ribs), all of which took no time at all to reach our table. Warm greek dinner rolls were also brought to us with a herb olive oil. The appetizers were fairly substantial portions! The meatballs and lamb ribs each came with six on a plate, enough for each of us and then some, both of which were delicious. The saganaki was perfectly salty served with freshly made pita, but what stole the spotlight was the kalamari. The batter was light, yet crisp, and the squid tasted fresh (not rubbery) considering we were in the Rocky Mountains. After demolishing the appetizers, and by that I mean we didn’t leave a single morsel on the plate, it was time for the main courses. Madeline ordered the grilled chicken Hercules sword, which was served with their housemade pita, Greek salad, roasted potatoes, and rice pilaf. The chicken was moist, potatoes seasoned well, and rice was flavourful. I could have done with less salad on the plate, as the onions were a little over powering, but a dish I would order again. Jordan ordered the classic Greek donair pita which came with mixed vegetables, rice pilaf and lemon roasted potatoes. The pita was incredibly filling that it was difficult to eat much more than that, especially after the appetizers. The raspberry mojito was a refreshing drink on the side, which was well balanced in profile. Despite the fact we were chatting until 10:30pm, there were still people eating in the restaurant; an indication that the locals enjoy the place. While the food, and service were above par, the price per person felt a little steep for an appetizer and an entree each. However, you’re going to pay for what you get, and there wasn’t a single negative thing about that experience. The next day, we were off for a sleigh ride in the mountains. The Warner Barns are located just off the main drag, making it a convenient location to find. Upon our arrival, we checked in after making our reservation online ahead of time a few days prior, and signed our life away. While we waited for our pick up time, we sat inside where you could grab a cup of coffee and a wool blanket to keep warm on the 45 minute ride. Our ride started on time, and despite the fact it was rather cold out that day, the sleigh was full! Each sleigh holds about 20 people. As a foursome, we were able to sit together in a row while we gazed up at the rocky peaks, listening to our guide explain which mountain was which along with the background of how they got their names. Along the ride, we encountered a rather large herd of elk who were sitting in the snow, eating grass, giving us the perfect picture opportunity. If you are thinking about going on one of these sleigh rides, just be prepared for the weather and bundle up. Sunglasses, would have been ideal to bring as the sun reflecting off the glistening snow was almost blinding. After the ride came to an end, you can take a moment to pet the horses and take pictures, then warm up by the outdoor fire pit with hot chocolate and roast your own marshmallows, which was definitely needed. For $32/person this was a fun tourist excursion to do in the winter, but there wasn’t necessarily anything special about it. If you have done a sleigh ride before, don’t expect this one to be radically different. 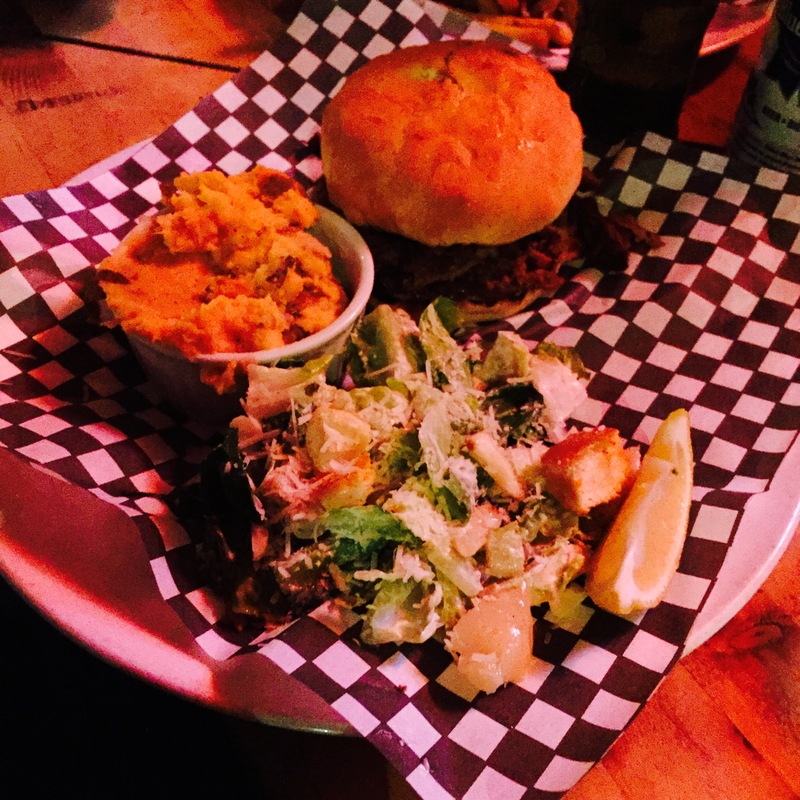 The ideal pub food is found at Eddie’s Burger Bar, and everyone seems to know it! Due to the limited space, there was a waitlist the whole time we were there. Upon arriving they took our name and number, and would text us when our table was ready. So we hopped into a bar down the street to grab a quick coffee and Bailey’s to warm up. It only took about 15 minutes for them to text us that the table was ready. Poutine, wings, salad, hot dogs, burgers, beer, and a milkshake bar are served at this happening local spot, which reminds us of a modern diner. If you want, you can even create your own burger! Choose as many toppings as you want, from an elk or bison patty, to a fried egg, jalapeno cheese, onion rings, and pretzel buns. On top of all that, you can have a poutine on the side. Choose from a long list of beers or go for the Eddie’s Famous Trashcan (long island mix, blue curaço, and a full can of red bull)…many of which are hanging from the ceiling. Your meal is served to you in typical diner fashion on paper in a wire basket, which really accentuates the quirky bar. Madeline opted for the Spicy Big Bird Burger had a ground chicken patty, lettuce, goat cheese, bacon, sautéed onions, pesto, tomato, drenched in sriracha on a brioche bun and a side of sweet potato fries (which you are not charged extra for BTW). If you like spicy food, I highly recommend ordering this! If not…steer clear. I put hot sauce on everything and even this was hot for me, but in the best way possible. Originally I thought the ‘patty’ would be a typical grilled chicken breast in place of a patty, but it is actually ground chicken formed into a patty – something you don’t see often. It was moist, and cooked perfectly. Even though I love spice, it was hard to taste any other components on the burger besides the sriracha. I know all the other toppings were there because I could see them, but hard to taste them nonetheless. Jordan ordered the Eddie Classic burger but substituted the beef patty for bison, and it was topped with cheddar, bacon, onion, pickle, lettuce, tomato, and Eddie sauce on a brioche bun with a poutine on the side. The burger was excellent with the bison patty, and the poutine it made for a very filling meal. We would definitely stop by this quaint joint again given the opportunity as the service and the food are well worth their value. The restaurant was pretty empty with the exception of a few tables. The place may have been run by a Korean family, which was an indicator that the food would be pretty authentic. We ordered tea and as an appetizer, we shared a plate of fried gyoza; fresh, hot, and crisp when it arrived to the table. The waiter brought over all the fixings (kimchi, spicy cabbage, sauces, etc.) and the hot plate, which is placed in the middle of the table on top of a burner to cook your selection of protein. It definitely made for a unique experience to cook your own food right at the table top. 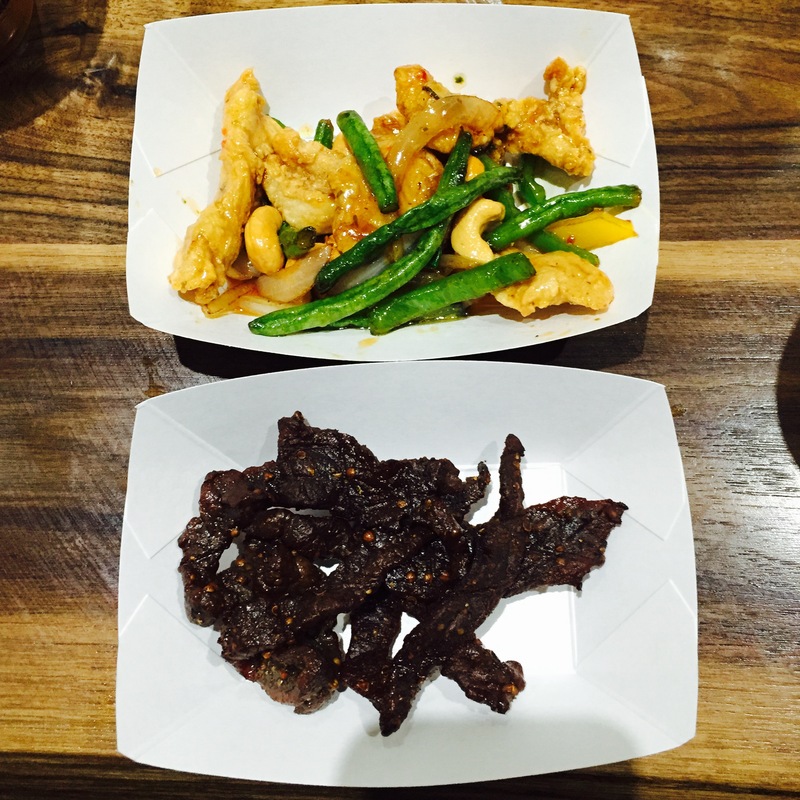 Jordan selected the bulgogi beef along with Jenna, and therefore their protein was brought out and cooked together which they then split. The serving size of the beef was substantial, and the sauce it was marinated in was full of flavour and really made the dish. The sauce was a great addition to the white rice, which Jordan thought it desperately needed. Madeline had the chicken, which has to be cooked last for food contamination reasons (I believe), but at that point after having watched everyone cook their food and already eating, all I wanted to do was eat it because I had been waiting so long yet it was not finished cooking. The sauce on the chicken was flavourful but overall thought that the meal was pretty average. Chicken and rice, with a few veggies isn’t exactly something to sing from the mountain tops. For the price per person ($32) I did not think the value of the meal was there and did not feel satisfyingly full – I wanted more. But that left us with room for dessert…. After dinner, we decided dessert and a warm drink were just what we needed to cap off the night. We stumbled into The Maple Leaf Lounge, a very Canadian themed place with vaulted ceilings, wood accents, stones walls, oversized arm chairs, snowshoe/ski decorations, and log cabin atmosphere. A little disappointed in the slow service, as we were just there for dessert. I wasn’t offered a refill on my coffee and food was nothing to boast about either. Madeline ordered the s’mores cheese cake which was the flavour of cheesecake that night, but not what I had envisioned a s’mores cheesecake to be. The marshmallows were raw on top, but I was anticipating them torched to get that fire roasted taste, and was drizzled with an overly sweet raspberry sauce. A flavour combination that I don’t think worked together. Jordan got the triple chocolate mousse cake which tasted pretty much like you would expect chocolate cake layered with chocolate mousse to be. That being said, it was served with a side of vanilla ice cream and you could immediately tell that it was homemade by the flecks of vanilla bean scattered through the smooth cream. While it satisfied our sweet tooth, I wouldn’t be in a rush to return for dessert. This Cajun Creole inspired joint did not disappoint! It’s a super cozy atmosphere with fun decorations covering the walls and lobsters hanging from the ceilings, you would almost forget you’re in the mountains. The menu is extensive! I’m talking if you went to this restaurant every weekend and ordered something new every time, it would take your years to try every dish on the menu. And that’s just breakfast! They also serve lunch and dinner, with menus just as long and full of variety. For breakfast, take your pick from pancakes, french toast, waffles, crepes, omelets, eggs benny, breakfast skillets, oatmeal, breakfast sandwiches, hash, grits, vegetarian options, and any side you can think of! There is literally something for everyone on this menu as there are flavor combinations/variations of every dish. Pair your meal with freshly squeezed orange juice or a cup of joe, and it’s the perfect meal. Their freshly made warm, fluffy, yet dense, buttermilk biscuits are definitely worth the wait. The portions are grand, and our waitress even ‘warned’ us about that fact, but we each ordered something on the side regardless. What can I say? We like to eat, and we love breakfast food. Madeline ordered the New Orleans’s Breakfast Skillet which had a little bit of everything: two eggs, two sausages, Canadian back bacon, grilled tomato, skillet potatoes, a pancake and buttermilk biscuit. I ate every single last bite…practically licked my plate clean. The pancake was fluffy, and that biscuit was heaven with a side of butter and jam. Jordan opted for the Breakfast Poutine: skillet potatoes topped with bacon, grilled onion, scrambled eggs, cheddar cheese curds and hollandaise sauce served with a buttermilk biscuit plus ordered a side of sausage. The plate was huge, but could have used a little more hollandaise. Can you ever have too much hollandaise? And what’s a meal without hot sauce!? Sample from over 100 different hot sauces they have available on their open shelf. If you’re looking for fresh homemade food, at a great price, be sure to make a pit stop and check out this authentic eatery…but certainly don’t forget your appetite! Given the chance, we would go back to this place in a heartbeat hands down and would make a trip to Banff solely to visit this spot again! When Jess asked us to pick the restaurant from the pre-approved list… Whitehall caught my eye. Something about the “Modern British” paradox was delightfully enticing to me and my British roots. The service was absolutely impeccable! we have entered many restaurants in YYC our blogging journey, and I must admit I have gotten accustomed, and event enjoy, the scoffs and judgemental tones from the high class diners as we enter restaurants in our polos and joe fresh shoes, however Whitehall does the impossible…. Treats all their patrons equally, something becoming increasingly more rare in this city. The politeness and customer service was not unnoticed! The food also hit the spot, anything with cheese or meat in this place and you cannot go wrong. My average pallet was taken on an above average journey through old classics with a modern twist. My pork was delightful and, having tried Jenna’s duck, it was equally tender and delicious. My favourite part of the evening was when we were discussing “Making a Murderer” and as our waiter was dropping off the entres he just whispered “Free Avery”. Overall the atmosphere and service set the restaurant apart in my mind and it makes a lovely little edition to the Bridgland food scene! Whitehall was something else. It certainly was white, the whole interior was bright, clean and crisp. I will admit it’s one of the fancier restaurants that we have visited in a while, and I felt quite ritzy being there. It had a small but tasteful menu which I appreciate since I I am small and tasteful. Our dinner companions were great sports and joined us in ordering three appetizers. Together we enjoyed the cheese soufflé, the elk tartare, and my personal favorite of the pate. For dinner I enjoyed the duck which was surprisingly tender and surprisingly flavourless. It came with a side of marmalade potatoes and honestly the potatoes were better than the duck in my personal opinion. I think I wasn’t anticipating it to have such a fatty texture but I believe that is the way it was meant to be served so don’t take my word for it. For desserts Mike and I shared the cheesecake and Jess and Scott share the ice Wine cake. Just and Scott were the winners as their dessert reigned supreme, ours quite literally was cheesecake, it tasted like full cheese. Overall I liked everything except the main course and if I would have picked the face wine cake I would’ve been happier. Our server however was excellent, he really made it a great experience. He was knowledgeable about the menu, attentive, friendly, and entertaining. The ambience was really great too. It felt very elegant whilst homey and it wasn’t too loud. Regardless of the restaurant our company was phenomenal and we had a great time and shared some good laughs. It was a real pleasure getting to meet Jess and Scott and if you have some time check out her blog cooking in my genes! BUT we were really looking forward to enjoying a meal together! We walked into Whitehall and were immediately impressed by the bright space and lovely decor. We spent time chatting and mulling over the menu, all while enjoying the lovely ‘cheese biscuits’ which were presented in this sweet, little vintage biscuit tin to our table. To start we shared a couple of the appetizers, trying the Bison Tartar, Cheese Souffle & the Pate. The Cheese Souffle was light, perfect cheese flavour and pure cheesy-goodness, it was my personal favourite. The Pate was super smooth and full of flavour, which we spread onto lightly toasted brioche bread. Next, we enjoyed our main courses – Scott had the Duck (as did Jenna) and I tried the Cod. The Duck was very well-prepared, it was extremely tender and the marmalade potatoes were the perfect accompaniment. My plate was a perfectly cooked piece of Cod over a bed of carrots with curry sauce – it was divine and the cozy flavours of the curry paired beautifully with the Cod. Our last course was dessert (of COURSE!) where Mike/Jenna shared the ‘cheesecake’ and Scott and I tried the ‘ice wine.’ All of us tried (and agreed) that the ‘ice wine’ dessert was a real winner – a lovely sponge cake, accompanied by honey ice cream and the showcase about this dessert what I like to call the ‘ice wine snow.’ It was like they turned ice wine into snow crystals – UNREAL. And to top off dessert, our server brought us a few house-made chocolate to go with our coffee. The chocolates were melt-in-your mouth and so delightful that we tried to bribe our server for more. Overall, the service was excellent and we had a real blast with Mike and Jenna, sharing a lot of laughs and stories. Whitehall delivered huge on atmosphere which rounded out the evening and we look forward to round two with Mike & Jenna! Blue Star Diner, Purple Peak, Yellow Door, Red’s Diner, Green Chili. What do all these places have in common other than making Calgary one of the most prideful cities in Canada? They all left me wanting something more. More taste, more service, more food, more hash browns and more toilet paper respectively. Focusing on Blue Star, the evening started with the excited anticipation of meeting our fellow bloggers, friends, and dare we say “siblings”, the Sangria Sisters. To say we were hungry was an understatement, and to say the restaurant was full was an overstatement. We walked in to join the two other people in the venue and awaited our counterparts. The restaurant was hip in the way that all too many are nowadays. However, it differentiated itself by the fact that our waitress didn’t have a beard. It felt cozy and warm, and would make a good quiet place for a first date with somebody you actually have plans to talk to. I was excited for Blue Star food. From what I heard it was a “must-try” in Bridgeland, if nothing else for the fries. I must admit that their lamb burger tasted a bit blaaaaaaaaahhhhhnnnd. Maybe it was all the hype, or maybe it is all the adventurous blogging, but it just didn’t feel all that special. At $45 per person (total including tip), I found it hard to find the value in this seek and find-esq atmosphere. But that being said the service was phenomenal and the company was divine. It should also be noted that this is one of the largest discrepancies between couples ratings on a restaurant we have ever had. Jenna and I giving Blue Star a 3.1 and the Sangria Sisters giving Blue Star a 4.3. Maybe I am just an angry drunk whereas they are happier. 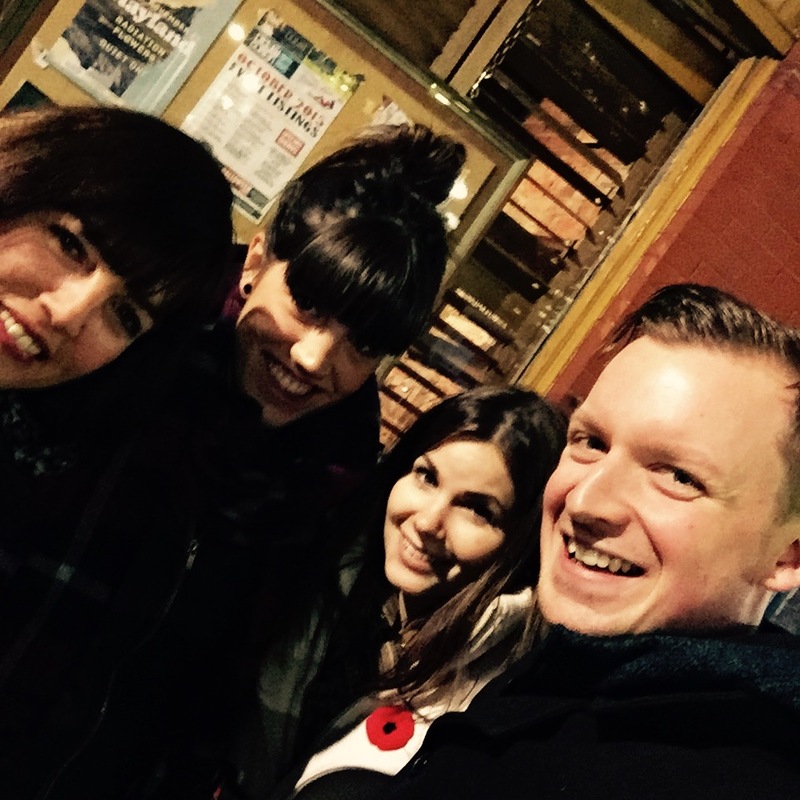 It was a real treat to go out with the two Sangria Sisters for our first review together! If you are wondering, “Are they as much fun as they are in their blog?”, the answer would be absolutely! We went to BSD, and I don’t mean Bermuda Shorts Day. Blue Star Diner is a petite little place with a modern feel and fun menu. Their wall of wine was also quite appealing. We let the sisters pick out a nice white wine for our dinner and they did not disappoint. The Sauvignon Blanc was really nice, light, and had a great fruity aftertaste. We also shared some guacamole which may have honestly been my favourite part of the meal. It was perfectly salted, light and almost fluffy, with feta if you can believe it! The homemade, perfectly salted tortilla chips were a perfect match as well. Basically, if you go, get that, unless you are deathly allergic to avacado’s, then I’ll understand if you pass. As a Dairy Lane lover I was excited to see what they had in store for dinner. There was such a great selection it was hard to choose, but I ended up going with their lamb burger. Again, their fries were perfectly salted, the ratio was just on point, they really know what they are doing. The burger itself was a bit dry and tasteless for me. I have a major obsession with the lamb burger at Thompson’s and I just don’t know if any other burger will ever be enough. So I just pictured the Thompson’s burger while I was with the BSD burger, it had to be done. For dessert, me and Laurie took the lead and ordered the salted caramel pumpkin cheesecake and the gingerbread cake with eggnog ice cream. If I am being honest, and I always am, neither were particularly life altering. I would say the gingerbread cake was better but really, both were just a piece of cake if you know what I mean. Overall, the night was fun ,the food was okay and I think if I went back it would be to try their breakfast which I have heard nothing but raving reviews for. Until next time Blue Star. In our rush to meet Mike and Jenna, we blew right past the Blue Star Diner…twice. The restaurant is unassuming from the outside, but quaint and cozy on the inside. Just like a diner should be. Located in the heart of Bridgeland, it was a perfect spot to meet up with A Couple Of Couples for our very first review. We’ll start with the wine, because that’s what kind of girls we are. We enjoyed a bottle of Blue Mountain Sauvignon Blanc from the Okanogan. It was fruity and sweet, just like us. The guacamole was embellished with feta cheese and smoked paprika pumpkin seeds, and served with homemade corn chips. It was absolutely delicious! After a debaucherous holiday season, I was in the mood for a lighter dish. I ordered the Pollo Maco, aka chicken taco. The chipotle chicken breast was nicely seasoned. Large wedges of avocado added to the freshness. As a cheese lover, I would have liked more queso fresco cheese to feed my addiction. The meal would have been more flavourful if it came with a side dish of salsa verde for dipping. The salad was crisp and sweet, although a tad overdressed. The Blue Star Diner is renowned for its burgers, so when in Rome… I ordered the Dairy Lane burger sans pickled onions, and added peppered gouda cheese. To differ from Mike and Jenna, I chose the yam fries. The crunchy sweetness worked in harmony with the coarse salt flakes. The burger was cooked to perfection. Crispy on the edges while remaining juicy throughout. It’s a good sized patty but I managed to power through, leaving some fries for the table. I might be biased ‘cause I skipped lunch and was getting hangry, but my meal did the job and went the extra mile. Dessert was warmed gingerbread cake with eggnog ice cream, and a salted caramel pumpkin cheesecake. The cheesecake was more like a mousse, which threw Jenna and Lori off. Mike thought he was doing us a favour by scooping off the salted caramel topping, but when heard our audible gasps, he plopped it back on. Val was the only one who didn’t want dessert, and the only one who liked them both. The server was pleasant and checked in often, as we were so busy chatting it took us over an hour to order. Our portion of the bill came to $36 each, without gratuity. Not too shabby for an excellent evening out. 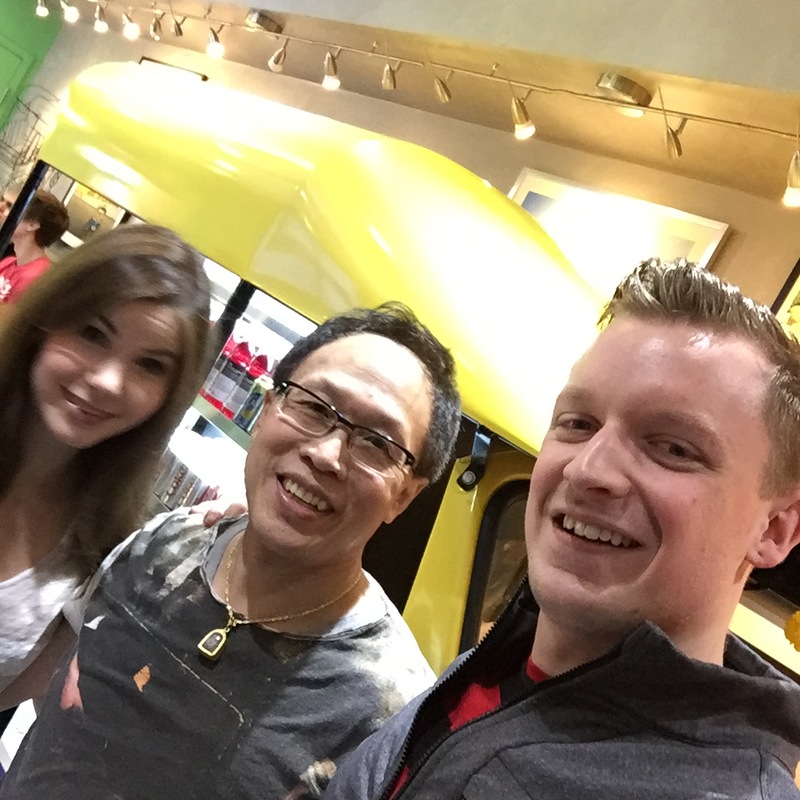 Thanks to Mike and Jenna for initiating an instant friendship! Gordo’s – You Wanna Pizza Me? I don’t know who this “Gordo” is, I have often drove by his shop on centre street… Curious… skeptical…. & scared…. Maybe it was the name, maybe it was the lack of seating, maybe it was the way I found myself slightly attracted to their cartoon logo… Regardless of the reason, something took us 1 year of living beside the shop to actually try the shop, and now I feel like we just wasted those years! Gordo’s pizza is something to try. It is tough to differentiate oneself in the pizza scene, but Gordo’s does it through a combination of unique topping (roast beef? Whaaaa?) and tasty crust. My mom use to tell me to eat my crust because that is the best part, for years I scoffed at this obscene notion but it just may be the case for Gordo’s. Corner of McKnight and Centre street, give it a shot! Gordo’s was alright in an average okay sort of way. It was just sorta like a yeah, okay, been there done that, sure, whatever, huh. Due to mikes love of pizza I have tried a bunch of different kinds over the years. I feel like the pizza here would do in a pinch but couldn’t beat out places like Posto or Una for me. The pizza, amazing and delicious. The crust was great, not a large amount of grease, generous amount of toppings. Great place for take out pizza, especially on those cozy date night evenings where you eat and watch your favourite movie or when you are getting together with friends for a fun evening. The all meat pizza was delicious as expected and there was not too much of a salty flavour. The Gordo’s special was not as expected, but still great. Overall a great eating experience. Moroccan… a word that is often mispronounced and a food that is often misinterpreted. To be honest I didn’t even quite know what Moroccan was… And I’ve been to Morocco… So luckily I did know what a Casbah was and how to rock it. It’s a little bit tricky for me to write a review on this one, because it was a flurry of emotion, so it’s probably easiest to just walk you threw my journey…. Secondly, we walked out of the dark streets into a brightly lit, fantastic smelling, music bumping slice of paradise. It felt like a child imagination but everything was tied together so nicely that you knew a great amount of care and attention to detail was given. Thirdly, the server was polite and whimsical in a stern way… I could not tell if we just became best friends, or he hated me, which, as odd as it sounds, was actually quite special in its own way. THE FOOD! Oh wow the food! It was PHENOMENAL! From the assortment of appetizers to the myriad of mains everything was fantastic and unique. We tried almost everything on the “chef’s” menu, but be warned, if you pick all the sweeter, more fruity, dishes it may feel like you are just eating deserts in the dessert! I really enjoyed the chicken dishes but the beef was also impeccable. I don’t want to make recommendations cause I think, just like through the dessert, you need to walk that journey alone. Finally, the bill…. It came to about $70 for each of us… And that was enough food to serve one or two more people as well! Not bad for such cultural food in the heart of downtown but still a little bit pricey to make this your Friday hang out. We would like to go back for their live belly dancing night, Jenna use to belly dance and it beats washing dishes for our meal! Morrocan… I love Moroccan food so it was no surprise to me that I was going to enjoy The Casbah. You wouldn’t really take much notice of this place from the outside as it is on the basement level of 11th ave and doesn’t really stand out. However inside was a totally different matter! I honestly felt like I was on vacation, like I had been transported to a different world. The inside was absolutely stunning, authentic and phenomenal. There are so many colours, intricate designs and cool fixtures everywhere! We were delighted to enjoy the place with our new friends who were up for the adventure of a 5 course meal aptly titled “Tour of Morocco”. It came with a soup, a salad, a phyllo appetizer, a main and a dessert. The soup, salad and dessert were set but you had your choice of 4 different options for the other two dishes. To appropriately experience Morocco we each picked one of the four dishes and shared, which was a really great way to try it all. The soup was nice and had a good lentil/tomato taste. The salad was fresh and something I would love to have more of with carrots, corn and beets. My favourite phyllo pastry was the spinach feta, how can that go wrong? The best main dishes for me were the saffron rice dish with lamb and the couscous with the meat sampler. I could eat them all day long! The desert was also a huge favourite for me because I am obsessed with baklava and classic vanilla with a caramel drizzle; I wanted to say “keep morocco-ming”. 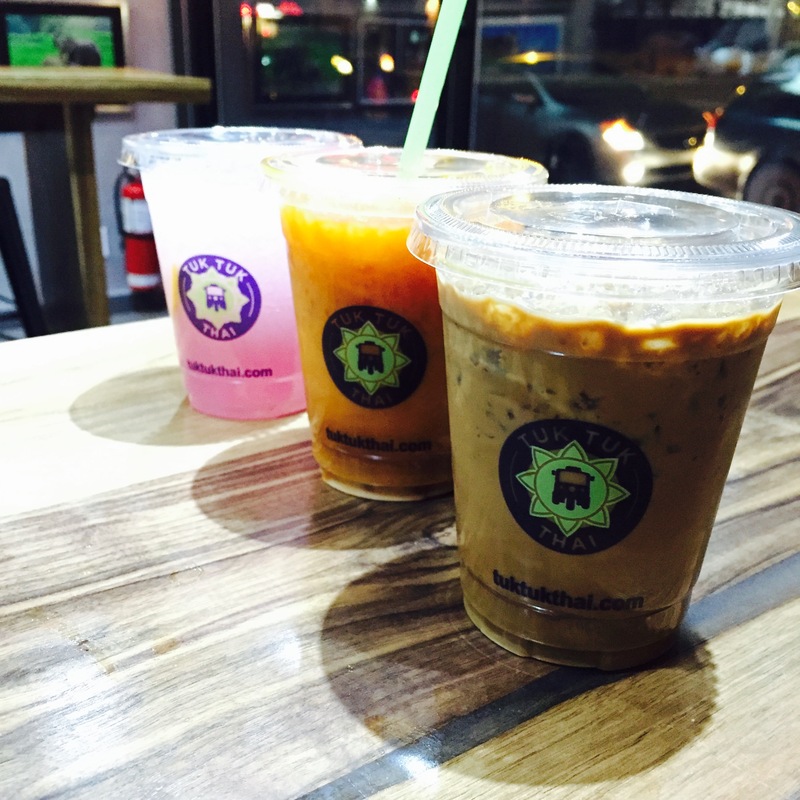 Lastly the mint tea, be sure to give it a try! The service was a little touch and go, our waiter seemed to be playing the “lets see how fast I can get away from this table” game. The only other thing that wasn’t top notch was that the food, albeit good, was all just lukewarm with the exception of the pastry’s. I would have liked it to seem a bit hotter and fresher I suppose. All in all it was an awesome experience with beautiful surroundings and amazing company! I love Moroccan food so it was no surprise to me that I was going to enjoy The Casbah. You wouldn’t really take much notice of this place from the outside as it is on the basement level of 11th ave and doesn’t really stand out. However inside was a totally different matter! Walking down the stairs into The Casbah, we didn’t expect to be completely taken out of Calgary to step into the country of Morocco. Now we don’t mean entering the Moroccan Sahara to escape the brisk Calgary winter, but entering a place rich in culture and architecture. The immediate feeling from everybody was a, for sure, 5/5 atmosphere. Having been there for the first time, let us take you through our travels to Morocco! We were sat at an intimate table perfect for our great company, Jenna and Mike. We all raved about the decor and furniture immediately! This is what we imagine the inside of a genie bottle would look like! One of our favs though, we got to wash our hands in rose water at the table and dry our hands with freaking soft towels – a tradition that our server says would happen if we were ever invited to a Moroccan home! Wait! First, what kind of luxurious fabric softener are you using and where can I get some?! We had a friendly server that guided us through the menu with ease. He catered to our lack of knowledge, however quickly dropped the ball, taking one drink order then walking away before the rest of us could get a second order in. Maybe it was the uninviting birthday party, probably because Jenna was eying down those presents hard, that he was also catering to! Anyways, we thought the drink menu was pretty basic. The wines, which it didn’t appear you could purchase by the glass, standard beers and cocktails with “Moroccan names”, but broke down to be your basic: gin & juice, vodka martini or your take on a Cosmo. For food, we toured Morocco with a 5 course meal. Overall, food was delish! We’d give the soup and salad both an “okay emoji” (my fav! ), although it probably wouldn’t do it justice for how tastey they were. The other 4 appetizers, served with either yogurt or hot sauce, yummy, but be careful to pair the right appetizer with the right sauce! Oops! But let us talk about the mains for a second. We chose 4 different entrées – chicken, lamb and shrimp over couscous, saffron rice or their traditional Tajine – comparable to a stew. Each was savory, bold in spices and offered a little something different from each other. One was sweeter, served with fruits and walnuts – a little surprising when going back and forth between trying the different dishes. Another had a “potato”, which almost gave me a heart attack! Thinking it was a vegetable, I forked a healthy serving for myself, put it in my mouth and could barely contain myself. I turned my head away and told Mike and Jenna that they HAD to try this salt soaked piece of death! Both Mike and Jenna, tried a pin sized piece of it and to my surprise, Mike liked it! Later, we learned that it’s a “preserved lemon” that’s supposed to be eaten in small amounts mixed with other components of the dish, not shoving the whole thing in my mouth like the barbarian I am. 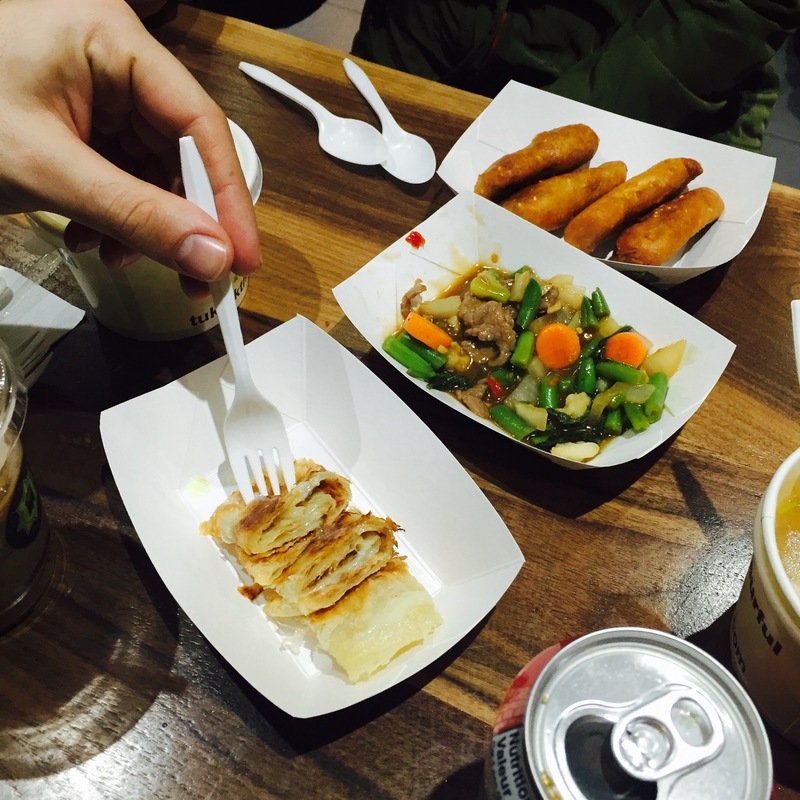 Anyways, the serving sizes were large, we quickly filled up, but the flavors had us wanting to try to eat more! Having this full course meal definitely took us through the diverse Moroccan complex. Pricing averaged about $70/person without gratuity. Not “too bad” considering the couple of drinks each other us had – we wouldn’t be opposed if it was slightly better priced! The overall experience would make us recommend The Casbah to others, if you’re looking to get away and experience a Moroccan adventure! The atmosphere is intimate and beautiful, the food was flavorful and bold, although serviced lacked slightly in speed. I couldn’t imagine what it would have been like if it was a full house. On a side note, this was our first dinner with Mike and Jenna. Dude! What a great couple! We had tons of fun and great laughs! We felt like we had known them for years! Who knew that 3 hours could go by so quickly and still end feeling like there was so much more we could have talked about! 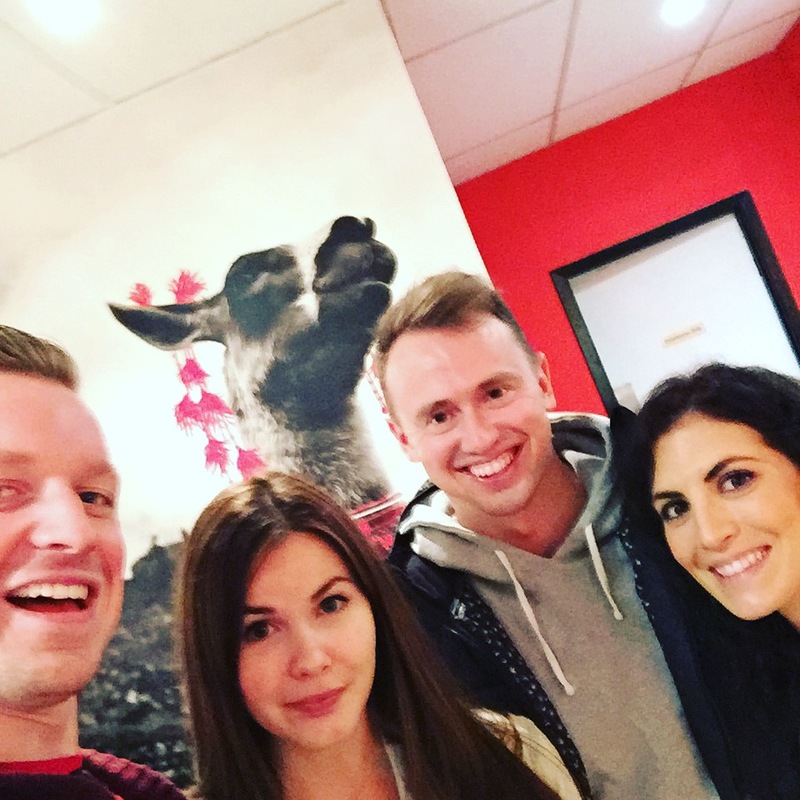 Then again, a solid 5 minutes was spent looking for Mike’s wallet and keys and taking the infamous Foodie Foursome Selfie! Anyways, we definitely are looking forward to another dinner with them again soon! The following post was from our friend and fellow blogger TerriLynne Hyatt on October 27th, 2015. We were so flattered by the post that we wanted to re-post it ourselves for our own readers! 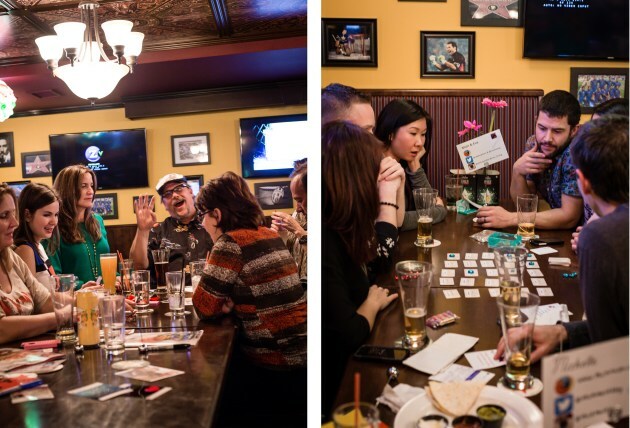 The next YYC Board Game Social will be November 26th and we have a couple tables left so please feel free to email us to register! They are held the 4th Thursday of every month (with the exception of December). If you enjoy Terri-Lynne’s post below please visit her site listed below. So what is it exactly? 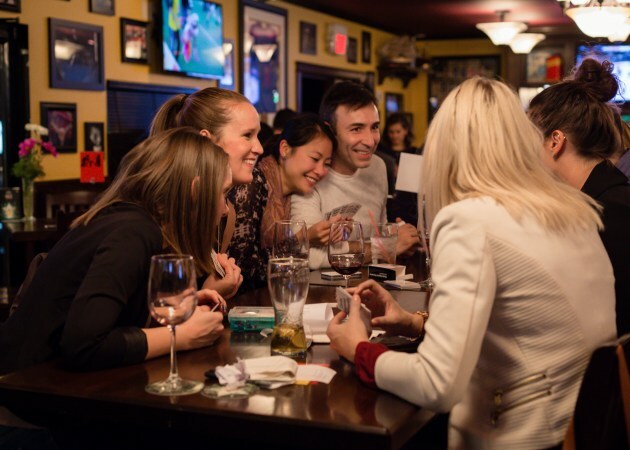 Basically an evening out, where you can have fun playing board games, from the familiar to the obscure, and you get to meet some of the people you follow or who follow you on different social media platforms. The event is held at Nicastro’s and hosted by the warm & very tabletop knowledgable David of Connect More Connect More and the lovely Jenna & Mike, who’s YYC Foodie Blog I follow religiously! When Mike e-mailed to invite me, asking if I would mind taking a few pictures while I attended, I was immediately in. For those of you who don’t know me well yet, it’s safe to say that the Hubby & I are huge board game geeks! Also, I am always ever curious about the “real” people who’s hashtags and profile names I’ve grown rather familiar with. 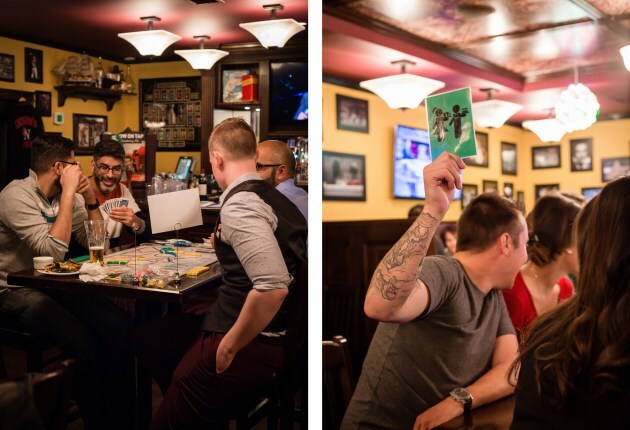 So since stalking is frowned upon … the inaugural Social Media Board Game Meet-Up it was! To say we had a blast would be an understatement. We met so many lovely people, and thanks to these awesome “Who’s who?” type place cards that were displayed on your table it was very easy to put names to faces to profiles to blogs, etc. The drinks were yummy, the food looked good (though I’ll admit we also got far to involved in our games to remember to eat something) and most of all the games were fun! 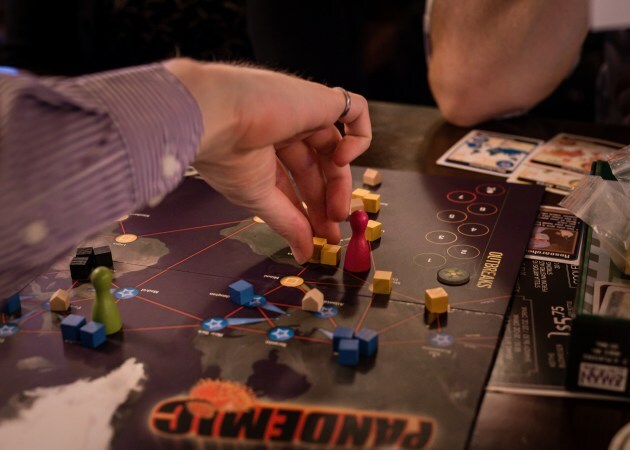 I had a chance to introduce Rihannon & her man to one of my all-time favourites: Pandemic, which proceeded to sneak attack wipe us out just as we thought we were going to save humanity. Grrr … hate to love that game … I also had the chance to try out some new to me games, including one I’ve had my eye on for awhile: Dixit. Safe to say my bank account is going to be a little poorer after a visit to my local game store. Thailand… Land of spicy food, Tuk Tuk’s, beautiful beaches, and one particular beach where a young Leonardo Dicaprio stole the hearts of a generation in “The Beach”. I have tried a lot of Thai, from the streets of Thailand to the Suncor food court with Thai Express, but it never really hit the mark as a place I would deliberately venture… Only to go to when the Opa line was too long or flight tickets were cheap, HOWEVER Tuk Tuk Thai has everything it needs to be my staple “go to” place on 17th for food. Good prices, amazing quality, friendly staff, and a unique establishment! My favourite dish has got to be the shrimp rolls but honestly every dish hit the spot. The Pad Thai also hit the spot. 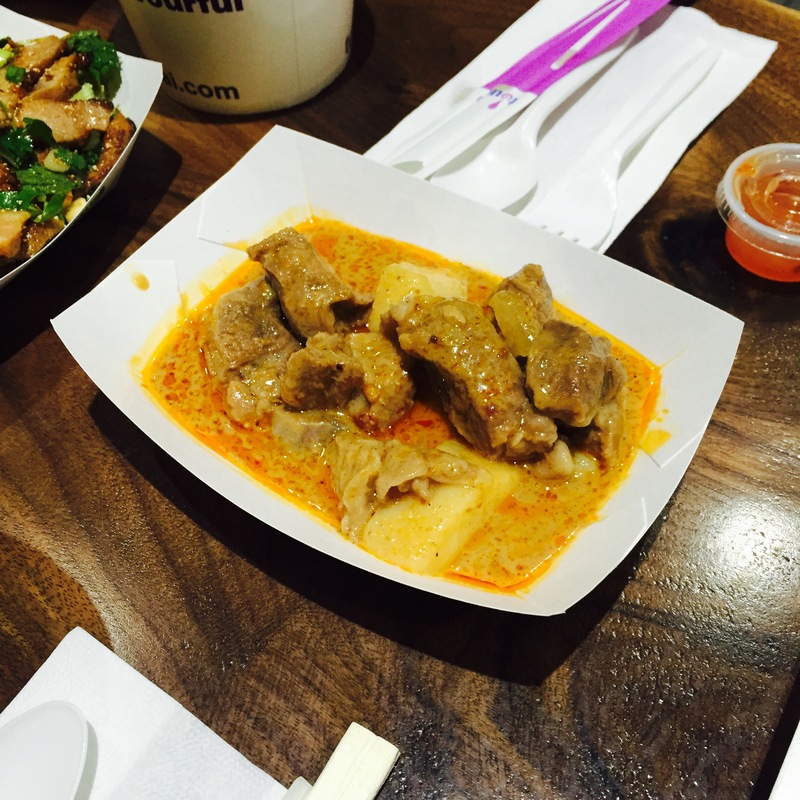 Sean noticed that the spice was a little downplayed from traditional Thai but I am sure if you asked the friendly staff they would pull out some of the traditional heat for you. 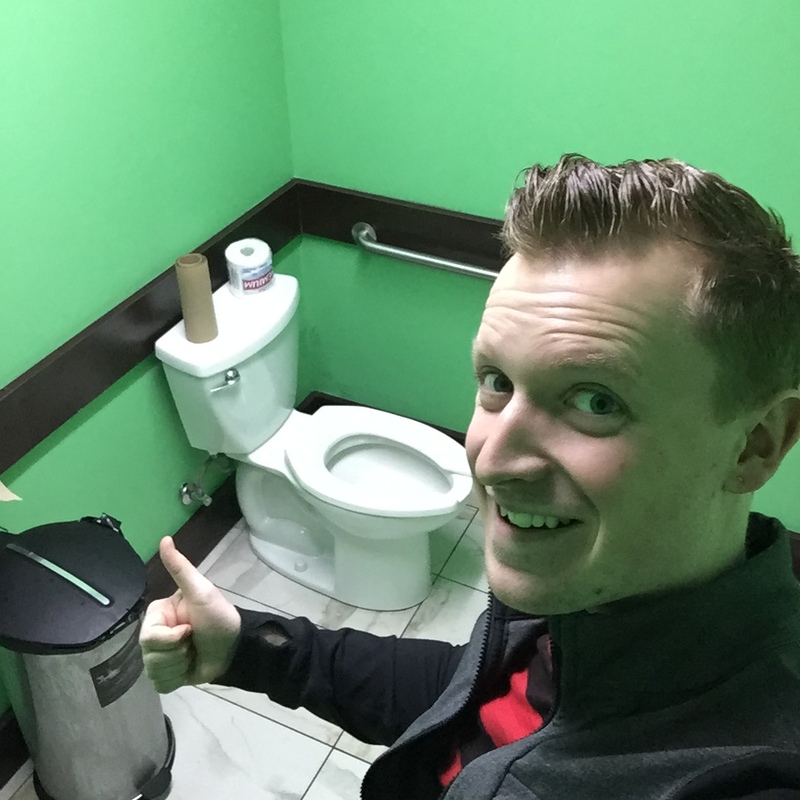 Also, it should be noted that the bathrooms are IMPECCABLY clean, which is rare on 17th ave.
Next time you are walking down 17th, just walk in and Thai something, Thai anything! Pick something random off the menu and give it a shot! All these little dishes are meant to share and be enjoyed! Or just pop in to use the washrooms. 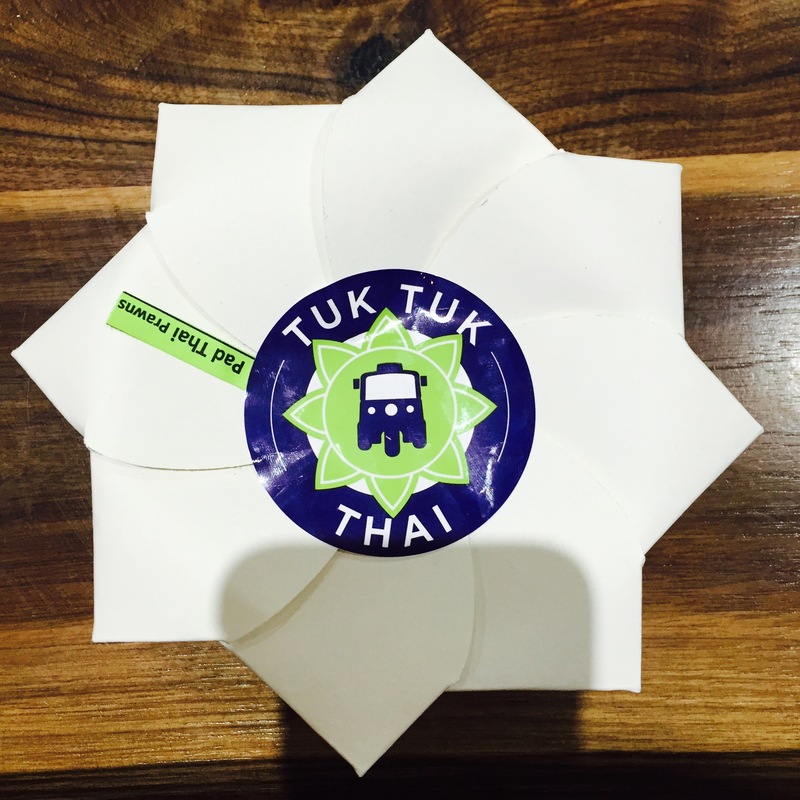 Tuk Tuk Thai has stolen my heart. Not only does it have amazing Thai food but the gentleman Sam who owns the restaurant is a absolute delight and success story. The ambiance in the place is quite nice considering it is a small space. The colours and the amazing murals that come to life make it bright fun and neat to look at! I also loved the actual Tuk Tuk’s they used as decoration/refrigerators for the cold food. Now for the food, it was 100% wonderful. I love Thai food but I often find that when I eat it I feel really full and sickly but that was not the case with this place! I could eat everything and still wouldn’t feel sick! I had so many favourite things but some that deserve a mention are the Pad Thai, the Green Curry, the Ginger Shrimp Spring Rolls, the Cashew Chicken and the Caramelized Crepes and Coconut Ice Cream for dessert. Now the food doesn’t come super spicy which is great for those of us who can’t handle spice so well, but if you do want spice fret now, you just have to ask them to add it! The flower food containers were also super fun to eat out of! I honestly can’t wait to eat here again, and I can say that I wish there were as many Tuk Tuk Thai’s around as there are Thai Expresses. Thai’ll be back. Have you ever seen something and thought, “Why didn’t I think of that?” That happens to me a lot. Like Chuckit! That plastic arm you can buy to play fetch with your dog without getting drool on your hands? This is the Chuckit! of thai food. It’s a North American-friendly, clean-cut, well-branded shop in the heart of Calgary. Why didn’t I think of this? 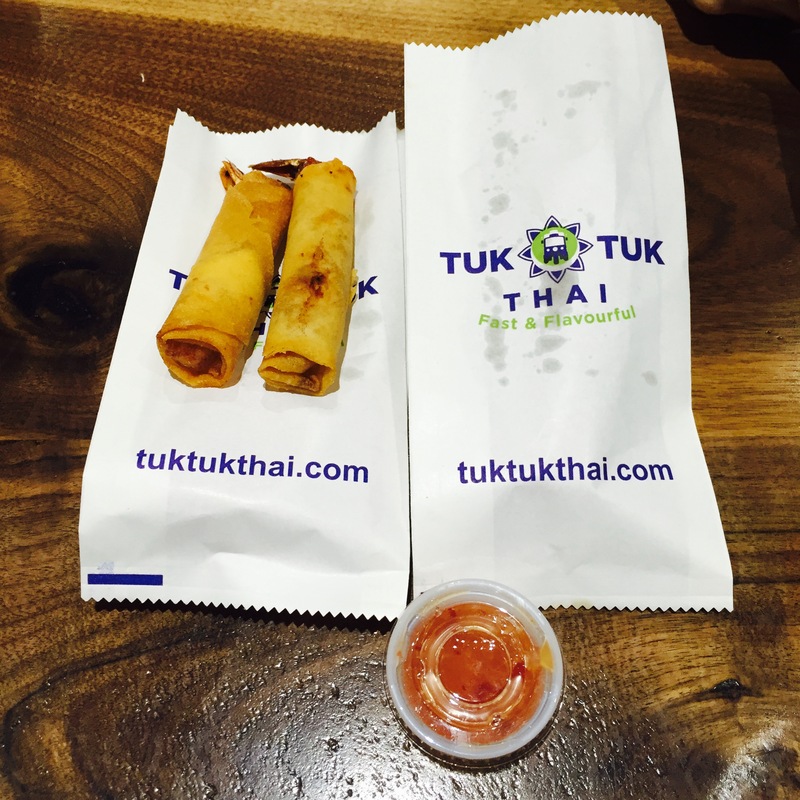 It makes total sense – Thai food is popular now but nobody has been successful in creating a strong brand for it. Well I didn’t because I’m a great eater of food, not a great cooker. We did, however, have the privledge of talking to the guy who did have the idea! After making our order we met Sam, a very passionate man who’s now seen his dream of owning a restaurant come to a reality. The passion has definitely come through in the food. 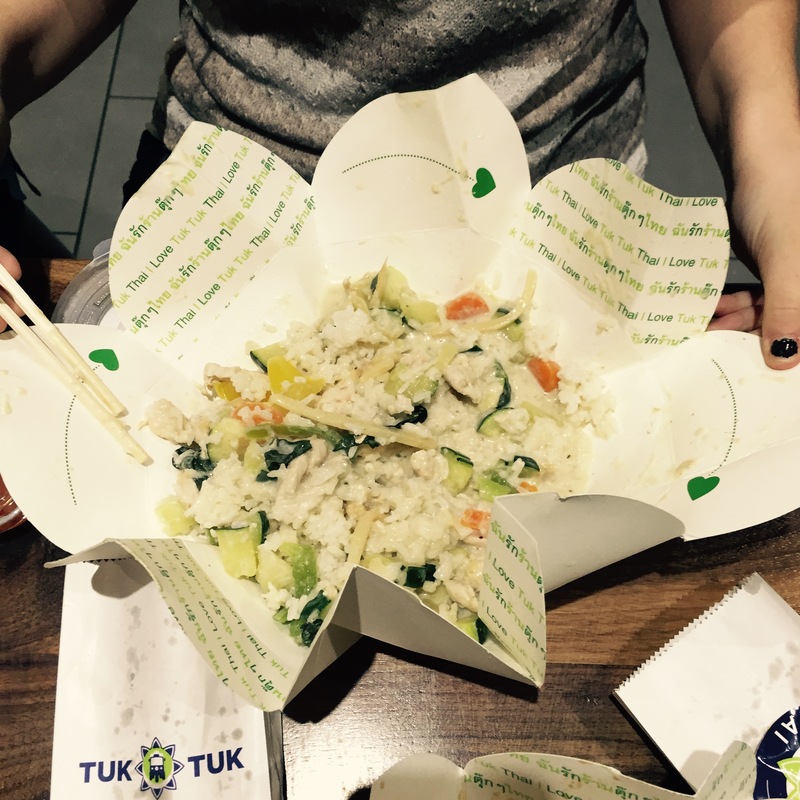 Even the presentation in the cool foldable paper bowls lends itself to this trendy thai place. The restaurant has a recognizable theme: logos on all the cups, an inviting color scheme, and a modern look. It even has a tuk-tuk fridge with drinks! 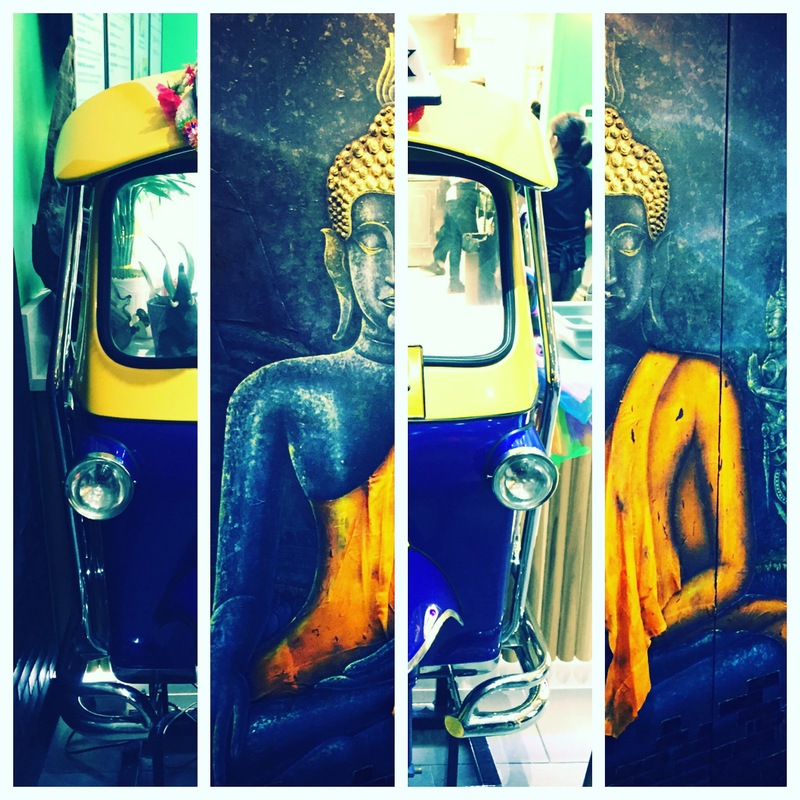 Although, I have been to Thailand and I’ve never seen a tuk-tuk as pristine as this one. We sampled a lot on the menu. I ordered the pad thai so I could make a fair measurement against other thai food I’ve had, but my surprise favorite was the moo moo chicken. It was a cooler, sour flavor I really enjoyed, I polished that one off. Other surprises were the prawn spring rolls, and the thai ice coffee. I have to mention, most of the food (other than the Calgary Flame) comes pretty tame. Thai food from Thailand comes with some kick, and there they take it easy on us tourists. The pad thai didn’t really register on my spice-meter. But Sam assured me you can get any of the dishes in multiple levels of heat. That’s good, because if you’re a real meat-and-potatoes type person you can give it a shot, then slowly expand your palette (this is the “North American friendly” part). I’d really like to see this place take off. The menu is concise, the image is established and I feel it’s a franchise just begging to be scaled up. I hope it does well. Good luck Sam! I guess I’ll have to come up with the next big thing. 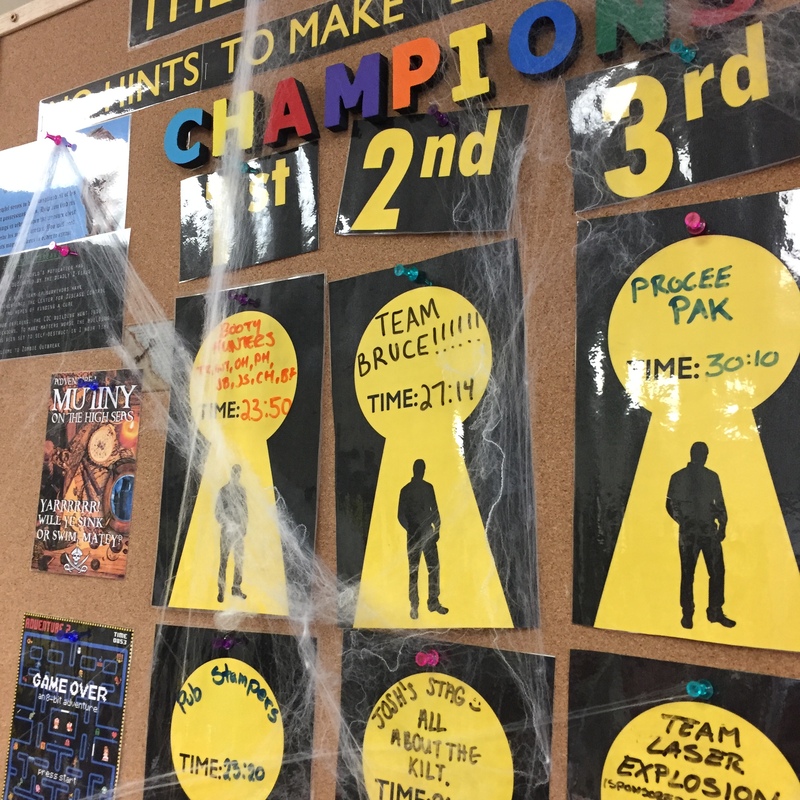 If you are a “pro” or have larger groups I would suggest skipping right to 3 or 4, however, the theme could be disturbing to some players… or exciting to some sicker players… You MAY even notice “Procee Pak” as the 3rd best time in Calgary… No Big Deal… I wont talk about the rooms too much as Steph gives the most AMAZING breakdown imaginable! 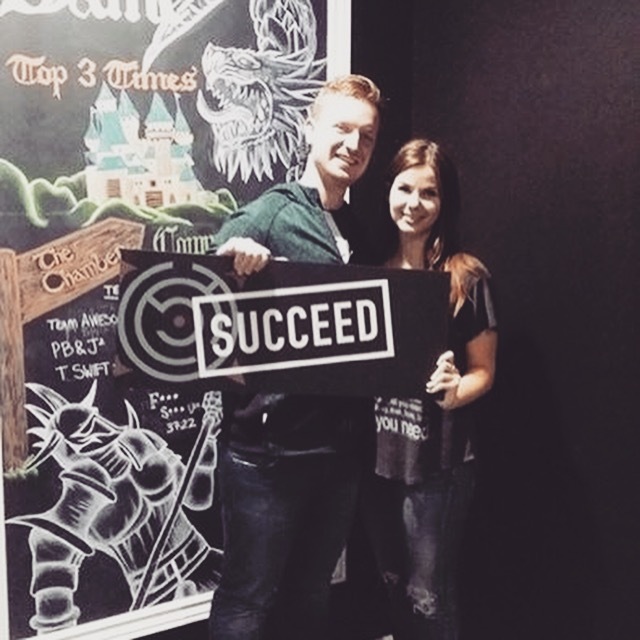 I think she has tried every escape room in the city! Also, as a special side note I should mention that just yesterday Jenna and I got to take part in the proposal of our friends inside “The Final Request” at BreakOut! It is actually how we managed to put together the above video… because like grandma always used to say, “If you can escape a room together… then you belong in a house together” or something to that effect… crazy granny. We wish them all the best and are so honoured we got to be part of their special moment! I have been an escape the room fanatic since I started playing the virtual escape room apps on my phone, so when I found out there were escape rooms to actually play in person, I was there at the front of the line with bells on and a foam finger ready to go. The three I have done so far have honestly all been wonderful and fun in their own unique ways, but I will give a breakdown of each of the escape rooms so you can decide for yourself should you ever choose to go. Exit: This was the first breakout room we tried when we were in Vancouver for my birthday. Since it was our first it will always have a special place in my heart, but of the three it was probably only my second favourite. I found it to be the most difficult in terms of puzzle solving but it could have also been because there was only two of us and it was our first time playing. They had some really fun theme rooms, we did Illusions and Transylvania, and I wish we could have tried the others. If it’s your first time I would not start here, but it’s still super fun even when you don’t get out! Locked Room: The locked room is a good place for first timers. It gives a good sense of the game and is a bit less intense then the others in my opinion. The clues aren’t always sequential but that does help make for good gameplay. The themes here are fun too, we did dead meat and the Pirate one, but the rooms are usually only one room sometimes with sub rooms (cages) that you need to get out of. So you don’t get the fun of opening up another room within the room. Of the three it is my third favourite but I still want to play the other two rooms! Breakout: this is my favourite escape room company yet. They do such a good job with the rooms and clues that every moment is riveting! The staff are super friendly and helpful and even though they only have two rooms (almost three soon) it makes you want to go back. This company has a really great use of technology which gives them some really neat additions that make you say “wow”. It is also nice here because you can still be on the leaderboard even if you use your hints (not that I ever would). If you are looking for a team build, a fun afternoon or something different then book with them right away! I am just getting started in the escape the room journey and I can’t wait to do as many as I possibly can! The room uses various technologies and puzzles were difficult. This is one of those rooms that requires team effort in order to solve clues in sequential order. Make sure you can work with your team members if you are going to try out this room. The Final Request is similar to The Chamber room adding technology to enhance the experience. Extra thoughts and details were placed in the décor making it a very immersive experience. Puzzles were logical and everyone can work simultaneously on different puzzles as we try to beat the clock! 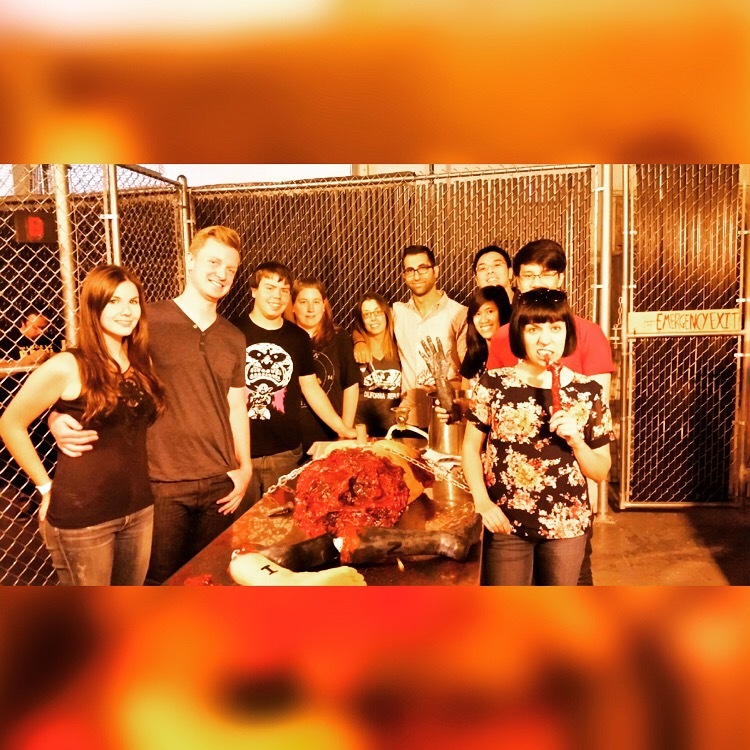 This was quite an experience…this is one of the unique escape rooms where the staff act as “host(s)” and plays a character as part of the story. They are there in the same room giving you clues if they noticed you were stuck. 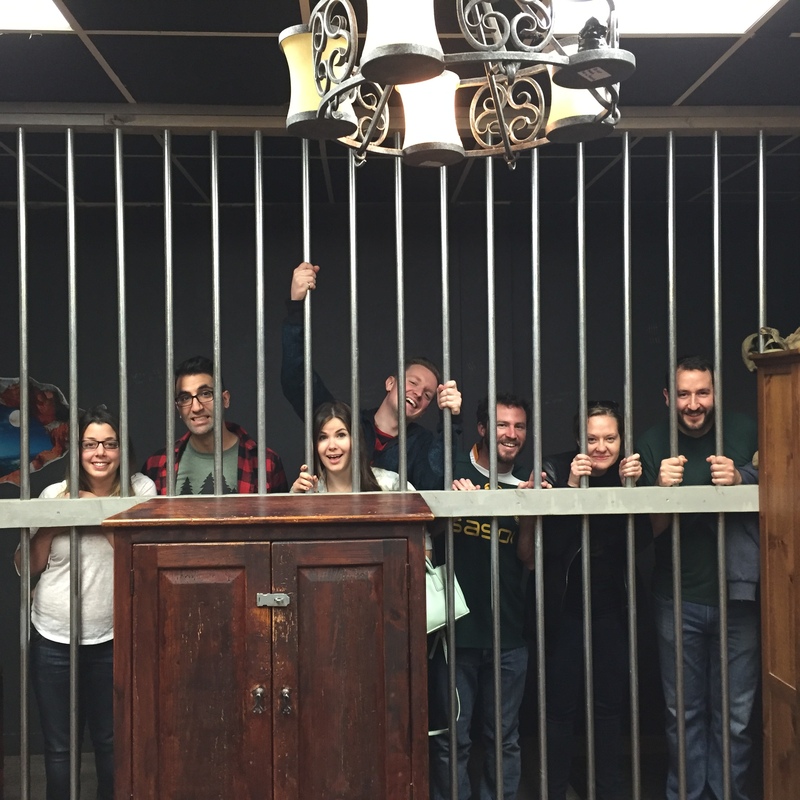 For this room, I would recommend having at least 6 people as it is one of the biggest escape rooms we’ve tried. Don’t expect any technology as nothing… NOTHING was glued or nailed down. If you like, you can move furniture and flip things over. There’s so much stuff going on in this room, making it a bit chaotic if you are playing an escape room for the very first time. Although we failed at escaping, I would say this was one of the better escape room experiences we’ve had. This is YYC’s first scary room (according to the owners there). I would say that this room is not intended for the weak of heart. For the first time, I admit I was actually scared. ..but this is as far as it goes as we encountered many problems with this room….no logical flow to puzzles, optional puzzles that made no sense to the room, lack of storyline and we even skipped out on a puzzle as we managed to get a key on our own without doing anything (technical failure). We broke out with 25 mins left on the clock but left unsatisfied as we weren’t challenged in this room. Overall Rating: 7/10 – I gave it a little bit higher score as there was screaming at some point. Nothing much to say here, awesome laser puzzle and that’s pretty much it. The staff was terrible, barging in and leaving the door open not to even mention that half of the puzzles aren’t logical or else something was broken. On top of that, we had to pay extra for this room..$30 per person! Again, although we broke out successfully, it felt like it wasn’t a complete escape experience. Overall Rating: 6/10 – I would give this a 5 if it wasn’t for the laser effects. One of their easier rooms in terms of difficulty. We went and did this on their grand opening day. Within 5 minutes into the game I noticed there was something terribly wrong as I’ve realized I have already escaped the room. Knowing this, I decided to close the escape door and locked it back up to go through all the puzzles in the room. After 30 mins solving most of the puzzles we decided to let ourselves out again and talk to the staff. The staff was nice, apologized and even gave us a free round in the other room. If it wasn’t for the technical difficulties, this room would have been much more enjoyable with lots of potential. 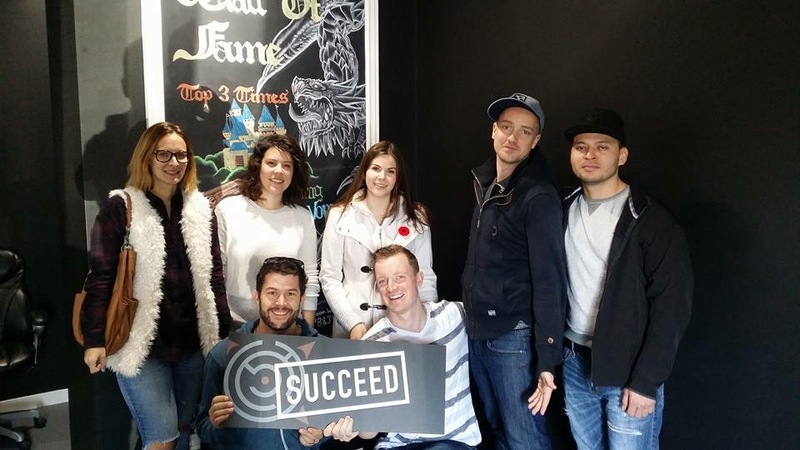 You will need a minimum of 5 people to escape this room (although I think 4 is possible). One of their most challenging rooms. Lots of technology (even more than Breakout) was used throughout. The puzzles were straight forward and not too challenging. Once again, we had a couple of technical issues (managed to skip a few puzzles to move forward). Despite this, I really enjoyed breaking out of this room as, it seems, like they put a lot of effort into putting everything together and there were lots of surprises. This room was well put together despite the lack of tech. Puzzles were challenging but required teamwork at the beginning. Make sure not to spread your two teams too thin… you still need equal skill sets in both to escape successfully. The Palomino is a foot stomping, calf wrangling, tobacco spitting, kind of place that I have spent many a day longing to enter from the safety of my 1st Street Station Ctrain stop holding my non-fat soy latte extra hazelnut with whip. It is the kind of place where, as one hears coarse voice beginning to elevate, one averts his gaze down the line hoping the CTrain arrives… so when Ally and Carrie decided we should give it a shot, I knew it was my chance to wear my (a bit too tight) cowboy jeans typically reserved for Stampede or Ranchman’s. The food was decent enough, but as some of our more avid readers know, I am fairly easy to please in this category… and I would hate to speak bad about the Calgary landmark, where I would certainly face the full wrath of the internet equal to that launched upon Alexis Frulling. The food is most definitely BBQ, exceptional BBQ at that! Our waitress was good but I was a bit confused when half the orders came out wrong. However, the professionalism, and apologetic tone she admitted her mistake with, was more than enough to make up for that. Honestly, everything about the place was cool. However, as soon as those live musicians jumped on stage, I knew this was not the place to enjoy a meal and catch up with Ally and Carrie… although the signs on the wall hit the tone the singers could not. 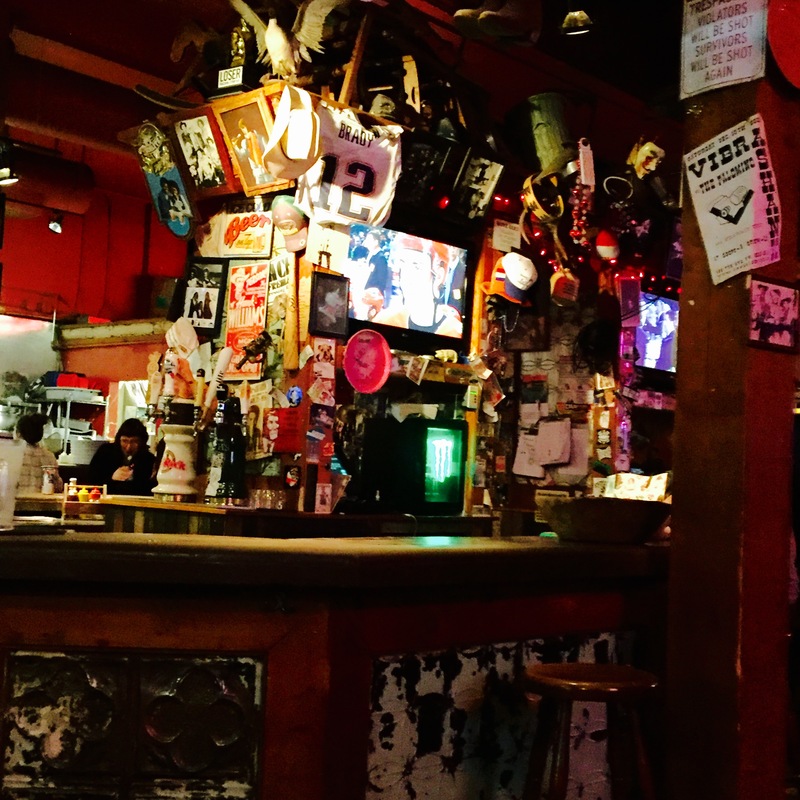 If you love BBQ joints it is definitely worth checking out, however, if you haven’t been to one and are just looking to dust off your cowboy boots, I would suggest Bookers. When I found out we were going to the Palamino, the place I so often gazed upon as I waited for the ol’ Tuscany train to arrive back in the day, my first thought was that I don’t have a weapon to defend myself if someone tries to start a knife fight with me. Luckily with all my mental preparation we made it into the restaurant without too much of a ruckus. SMOKEY, that’s the smell that hits you the moment you get in. It’s almost like you are in a campfire. A savoury, meaty campfire. It definitely made me feel slightly more rugged like I was in a cabin somewhere about to have a showdown. I would say the overall ambiance was eclectic as there was something random as heck on each and every wall for you to look at. The appetizers were delicious! We had deep fried pickles (a personal favourite of mine) that were seasoned well with a nice chipotle mayo dip. We also found out that we stumbled in on rib night which was awesome because the ribs were $1 each, well seasoned and reasonably lean. I would say I prefer their ribs way more than the ones from Bookers, but that is just me. My main dish was less satisfying. I went for the burger thinking it was a smokehouse staple but it was dry, the bun was over crisped and it was generally flavourless. One very American thing about it was you get two side dishes or “fixin’s” as they are aptly named. I had their garlic fries and caesar salad and one thing is for sure, I still smell like garlic. Now the music gets its own little blurb because my ears are still bleeding. They had a “live artist” and I am no Sinatra but it was as if the two artists didn’t even know what a tune was. It was quite aggressive and very very loud. Like “please god make it stop” loud. The service was kind of like double bubble gum. It’s started off good but then it got not so good. Our waitress got 50% of the orders right for the mains, but she was a kind soul, she tried. If you were to go on a non-live music night just for ribs and appetizers I would say do it, but it’s no prize winning horse. The Palomino looks very unassuming (read: sketchy) from the outside, the kind of place we probably would never think about actually going into as a mother-daughter duo for a Tuesday night dinner. The location on the C-train line on 7th Ave maybe has something to do with that. We walked in 20 minutes before we were scheduled to meet Mike & Jenna to have a glass of wine. Good thing we did, the place was PACKED. The hockey game was on, the place smelled like smoked meat and garlic, and all surface areas were plastered with posters, signs, and other random memorabilia. It reminded me of the type of place I probably would have gone to see a punk band play when I was younger and thoroughly enjoyed those kinds of eclectic, dirty dive bars. Kind of a “throwback” for me. Now I was here with my mom. Cool! Our red wine came in small glass cups… is this hobo chic? I think Carrie let out a small sigh of disappointment when the server set those in front of us (she’s kind of a wine snob!). But really, made sense “dive bar” atmosphere. Mike & Jenna showed up and we moved to a small rickety table just big enough for the 4 of us, with mis-matched chairs. 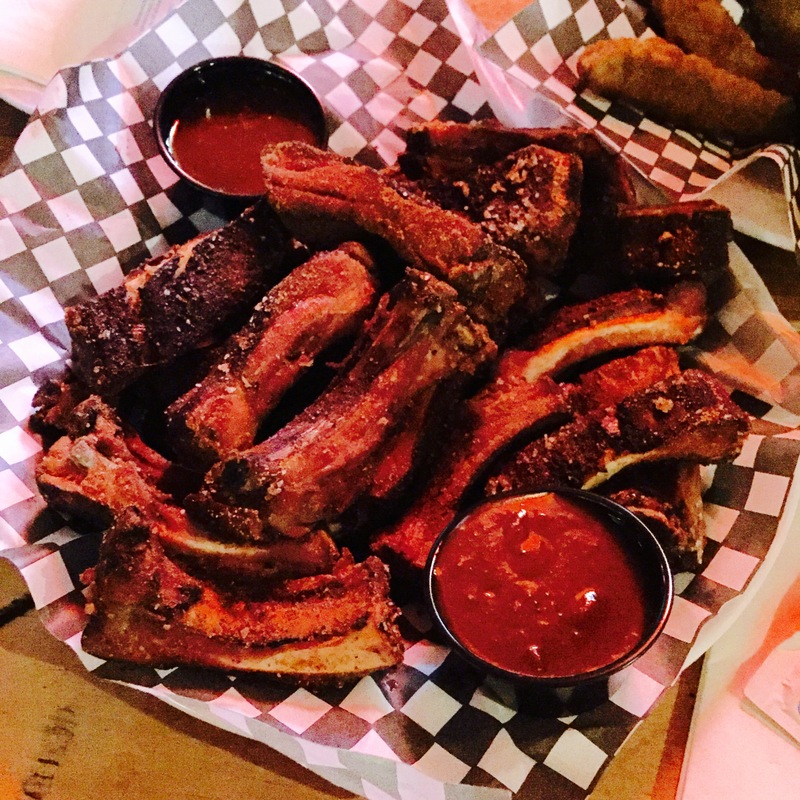 Because it was a Tuesday night, we had the “buck-a-rib” special and got 20 ribs. 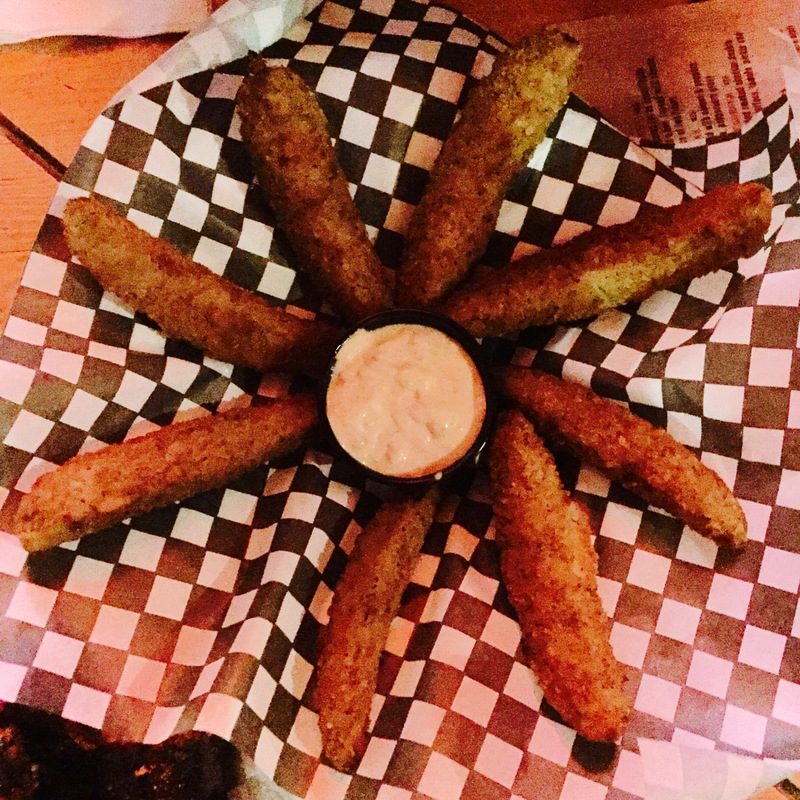 We also got deep fried pickles because Carrie hadn’t had them before, and how can you live your life without having eaten deep-fried pickles? It would have been rude not to order them. The appetizers were awesome. You can’t be Canadian and not love cheap ribs. 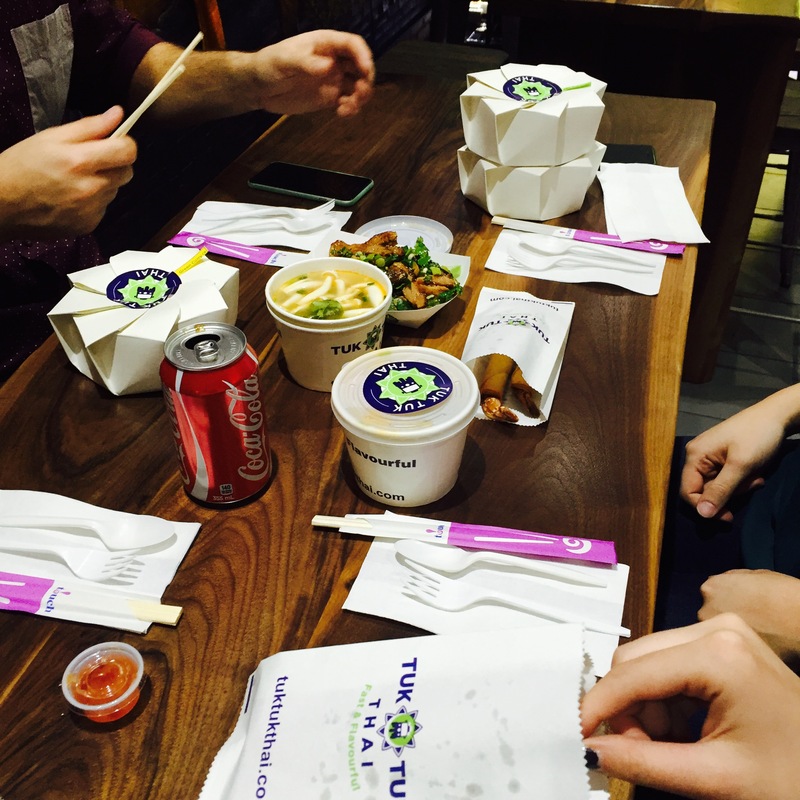 If that was our whole meal, the place would have probably had a higher score. The mains came out, I got that feeling of “YES! FOOD!” as I saw the server walking towards us with plates. Cheeseburger – Jenna’s, Pulled Pork Sandwich – Mike’s… Cheeseburger – silence, Pulled Pork Sandwich – silence… “So sorry guys, I made a mistake, I put in the order wrong, the food will be up in 5 minutes!” My excited feeling turned into sadness so quickly. So Mike and Jenna started eating and we waited. And waited. And waited. Finally it came! Mac’n’cheese with bacon for myself, Chicken club with side garlic fries and corn cob wrapped in bacon for Carrie. The Mac’n’cheese was amazing. 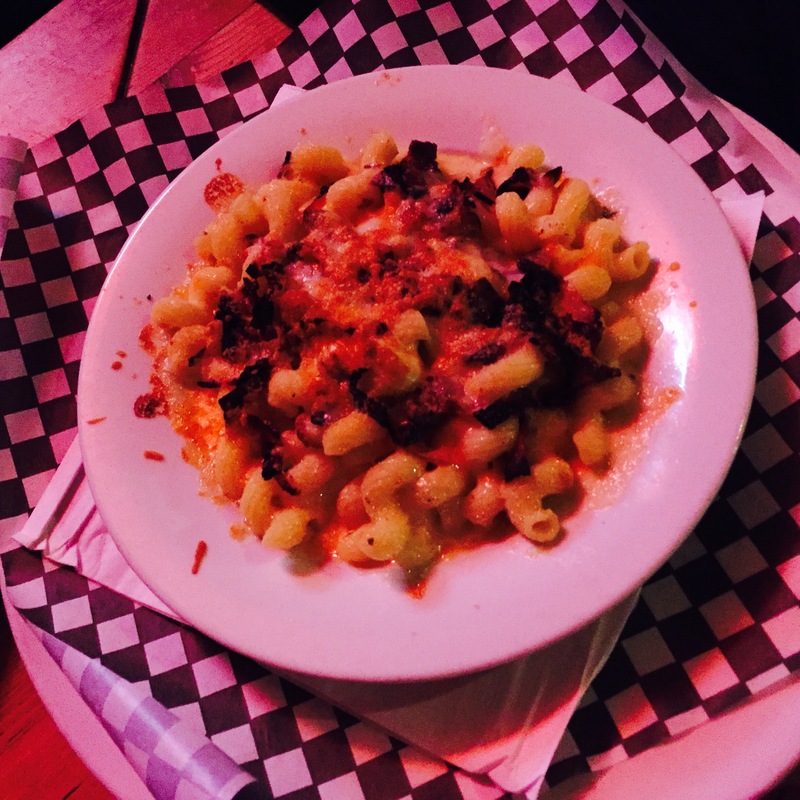 How can you go wrong with pasta covered in cheese baked with more cheese and BACON? 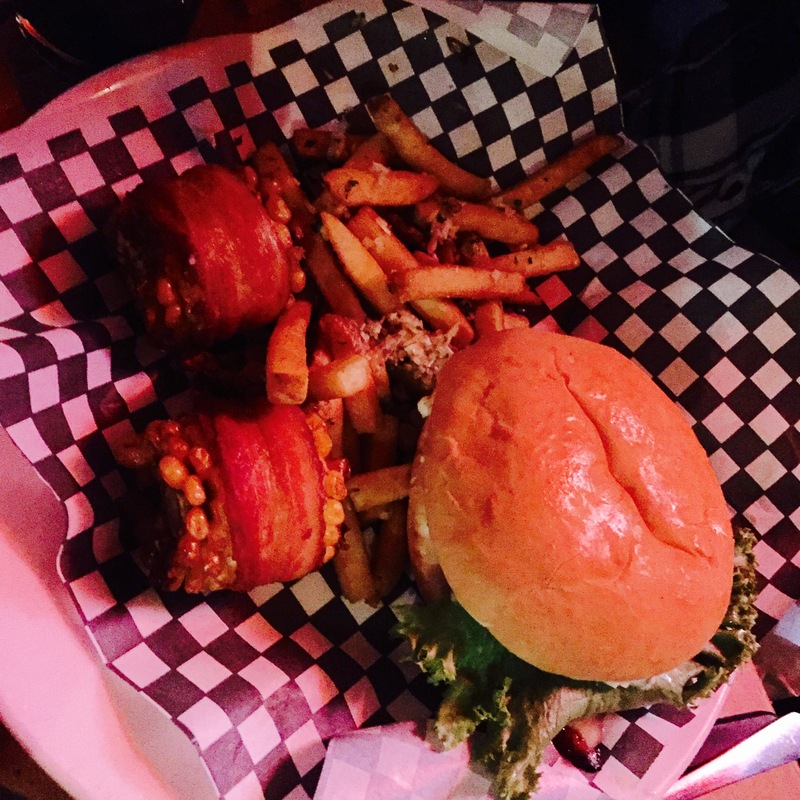 Carrie’s chicken club was marginal at best, and the corn lacked any flavour which was surprising because …bacon. The garlic fries were so potent that I think I can still taste them a couple days later (not that that’s bad, just noteworthy). Near the end of our meal some live music started in the back corner, and we were reminded that we are more “adult-y” than we give ourselves credit for. I found myself thinking “Oh my, this is a bit loud isn’t it? Can’t they play a little more quietly?”. My younger, punk-music loving self would have been horrified! By the time we paid our bills it’s safe to say we were annoyed by the music and not being able to hear each other talk. Overall, the Palomino was a cool place, you can’t really have high expectations for the food and wine when walking in there. The ribs were good, the Mac’n’cheese was amazing, and the atmosphere was excellent. The service could have been better, our meals could have all come out at the same time, and I was shocked at how expensive the bill actually was in the end for the place. It’s going for that “dive bar” feel but has more of an “upscale” budget. Just goes to show that in a city with a healthy hipster scene, there’s a market for over-priced pub fare. While travelling the desert dunes and Machu Piccu peaks of Peru, the locals would tell legend of a pair that made it to Canada, Calgary specifically, and started a restaurant that didn’t compromise the Peruvian taste for the rough and tumble locals. At the time I thought it was just a myth to get me to buy the 90 sol 100% Alpaca poncho and matching hat… But when I walked into Inti… I knew I had found the legend the Mayans had wrote songs about. 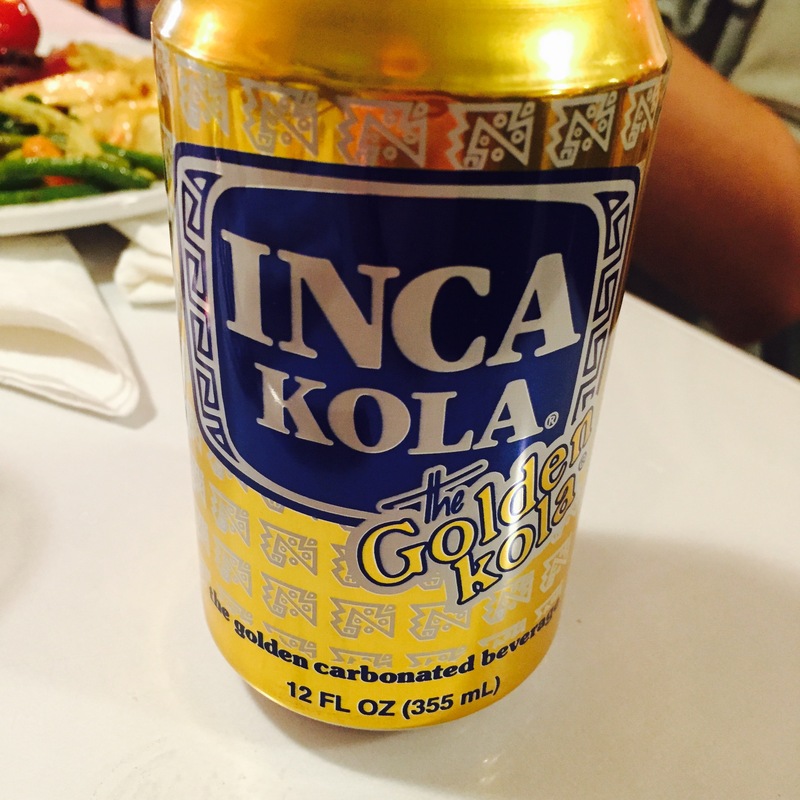 From the Yuka, to the refreshing Inka Cola, this place was not a Peruvian Restaurant in Canada, it was the Official Peruvian Embassy in Canada! And its address had the postal code “H1D G3M”. Everything brought back James and I’s trip to Peru. The deserts were even made with imported Cusco chocolate, which the restaurant owner assures us (somewhat biased) is home of the best chocolate in the world. At $25/person for the buffet the value was there, and the cerviche has been some of the most authentic we have found inland yet! A word to the wise, it took James and I two weeks to realize in Peru they do not bring you your bill, it is seen as rude to rush you out, and of course Inti follows the same customs so you must go up to pay your bill. Inti was like the Peru trip Mike never invited me on. 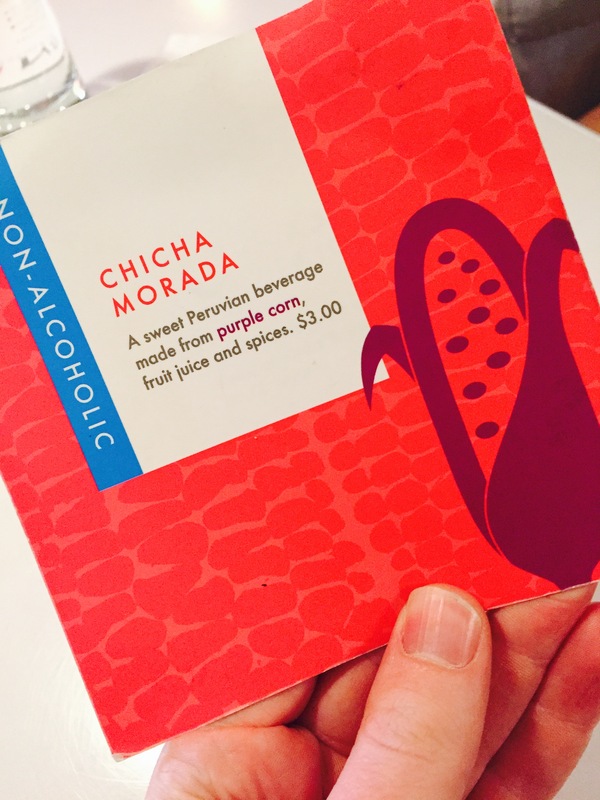 I saw llamas, enjoyed some traditional Chicha Morada, and tasted all the flavours of Peru (except Guinea pig which I was happy to miss). The restaurant is smaller so it has a nice atmosphere and isn’t too noisy. 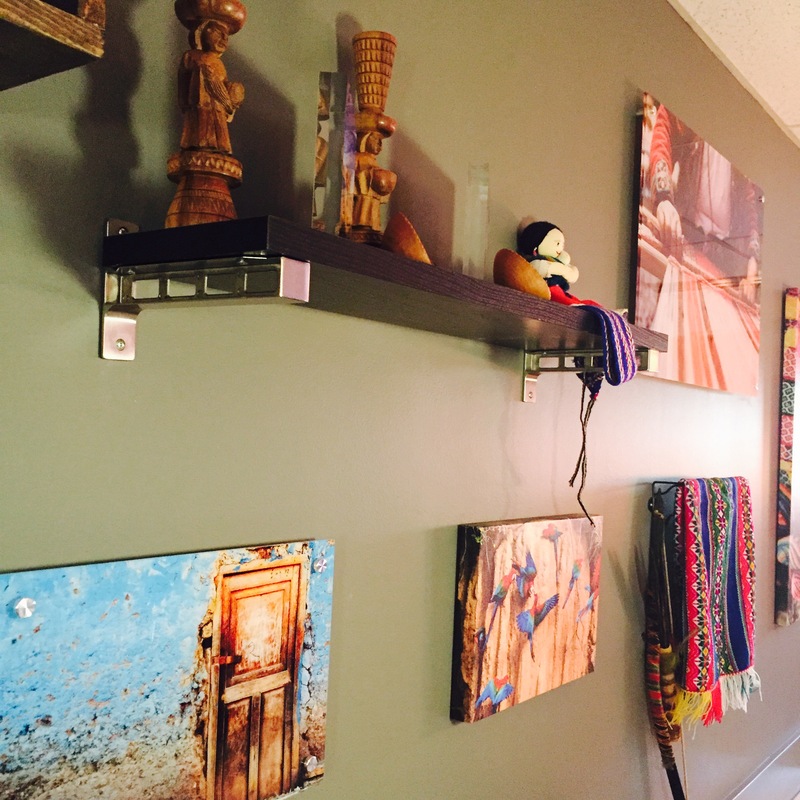 I really enjoyed the Peruvian decor with the fun facts about Peru on every table and neat trinkets on the walls. I am not the expert but Mike and James assured us it was just like Peru, a topic that re-occurred throughout the evening #memoriesofmikeandjamesdoperu. One lady who I can only assume was the owner was an absolute delight! She was a great server, host, and by the end of the evening, friend. She kept calling us things like darling and I felt darling. She recommended the buffet as you get a large variety and a bang for your buck for $25 and all-you-can eat. 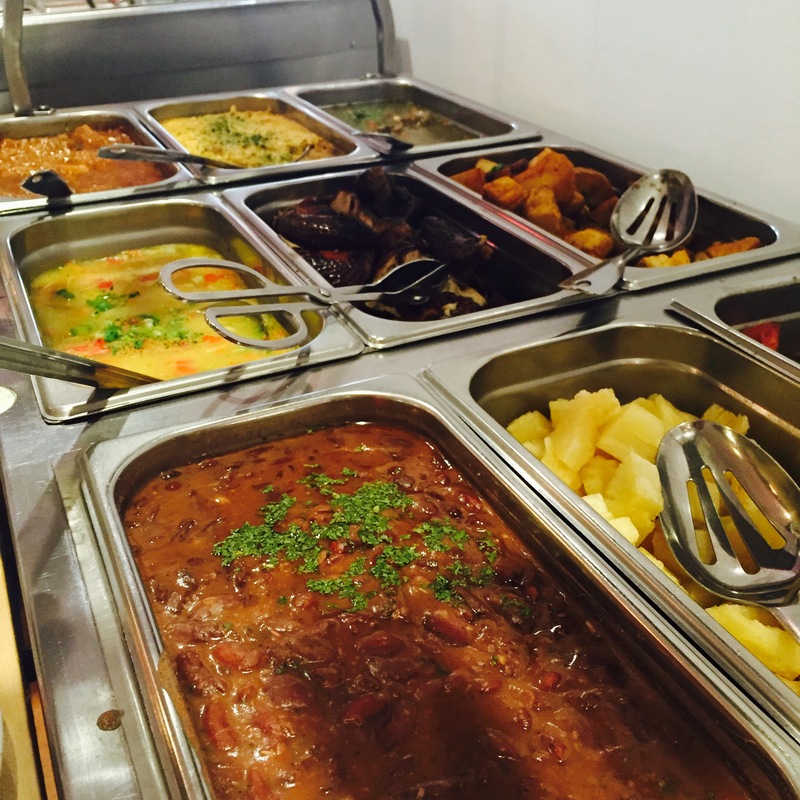 It was a great recommendation and I would also encourage you to do the buffet if it’s your first time there so you can try a bunch of the neat Peruvian dishes. Some of my personal favourites was the seafood ceviche, the chicken stew, the yuka, and the rice pudding. It was a really nice change of pace from other restaurants we have been to lately and I would love to go again someday. So to end in the word’s of Arnold Schwarzenegger “I’ll be back”. Based on the location, you wouldn’t expect such a great restaurant nearby (kind of an industrial area). It has a very modern look with a mural of a camel, complete with Peruvian decor. The service was closer to a Peruvian mom serving dishes from her kitchen than your typical waitress. You should start your meal with either an Inca Ko(a bubblegum type soda) or Chicha (a spiced purple corn drink), both authentic peruvian beverages. We chose to go with the buffet versus a-la-carte as close to half of the items on the menu were included within it. 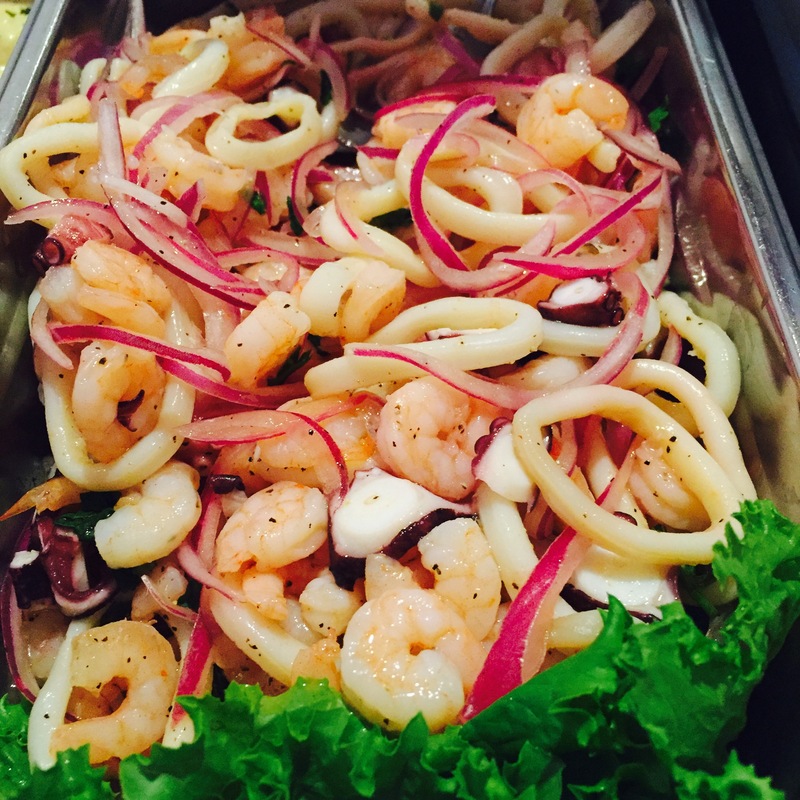 Try to sick with the authentic Peruvian dishes. 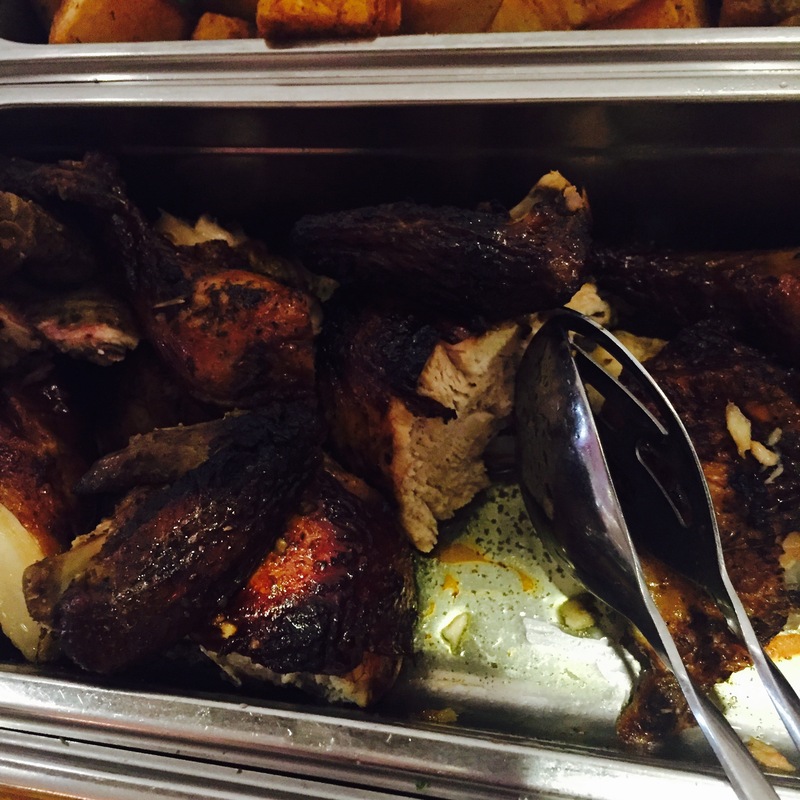 The Huachachina Potatoes, Shrimp Cerviche & Rotisserie Chicken were among our favorites. Overall, it felt like we walked out of a construction yard right into the heart of Cuzco. The price was $25 a head for the buffet, which was very fair for the variety and the amount of food we enjoyed.